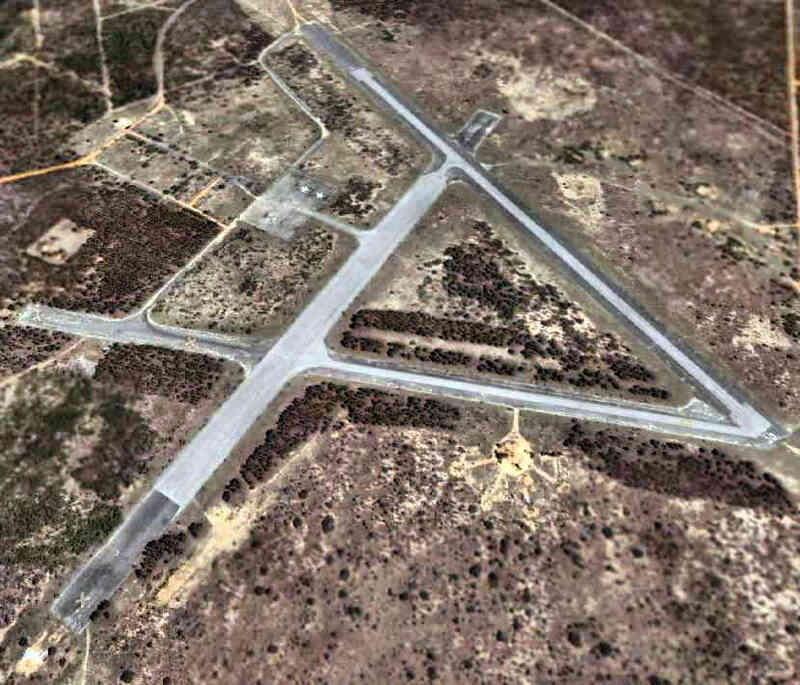 Not much is known about this small airfield, including its name, purpose, or date of construction. or 1970s USGS topo maps. 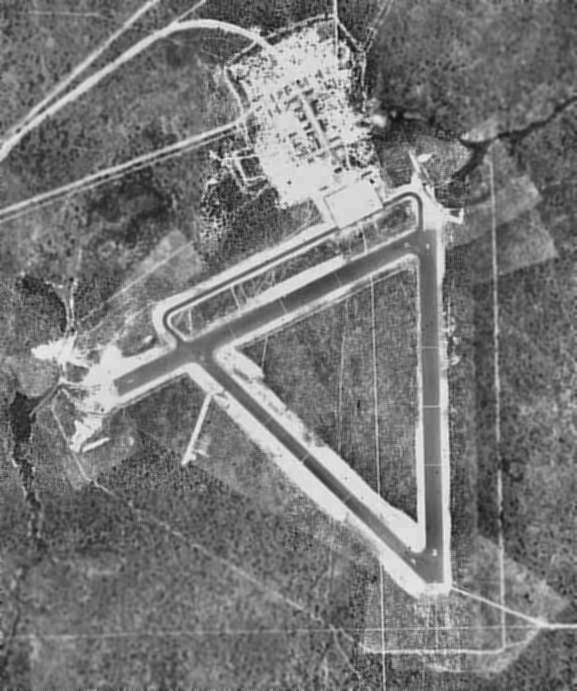 The earliest depiction which has been located of the Freeport Airfield was on a 11/15/79 aerial photo (courtesy of Dallam Oliver-Lee). It depicted Freeport as having a single east/west unpaved runway. 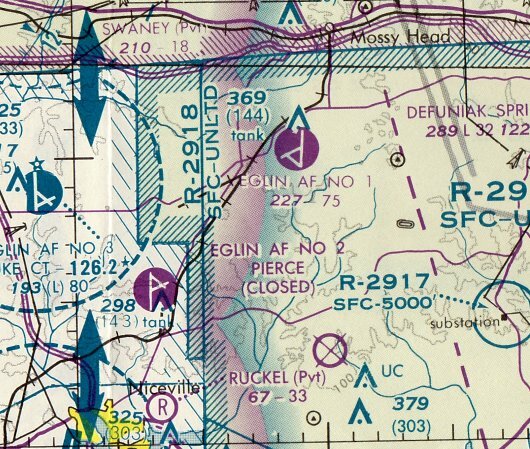 Freeport Airfield was not depicted on the 1980 New Orleans Sectional Chart or June 1993 New Orleans Sectional Chart (courtesy of Ron Plante). A 1994 aerial photo (courtesy of Dallam Oliver-Lee) depicted Freeport in the same fashion as depicted on the 1979 aerial view. 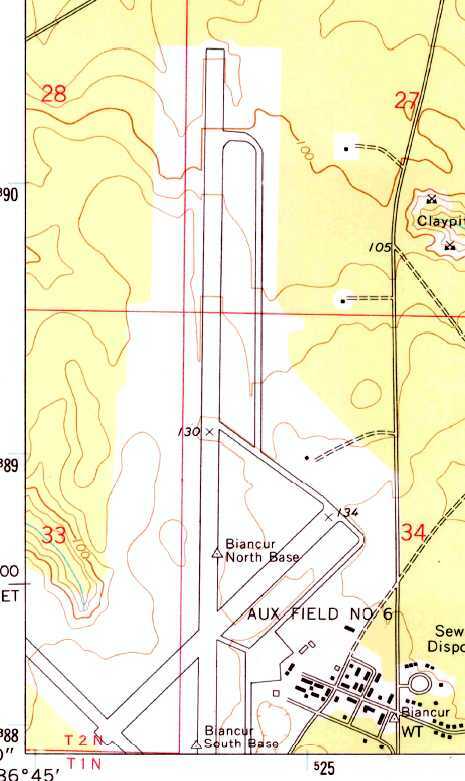 The 1996 USGS topo map continued to depict the clearing of the runway, but not the airfield itself. was a May 2007 aerial view (courtesy of Dallam Oliver-Lee). as the runway area appeared to be starting to be overgrown. A December 2012 aerial view (courtesy of Dallam Oliver-Lee) showed the former Freeport Airfield buildings remained standing, and the runway outline was still recognizable, but it was heavily overgrown. The site of Freeport Airfield is located northwest of the intersection of West Bay Loop Road & Delorean Drive. as depicted on the 1945 Mobile Sectional Chart (courtesy of John Voss). 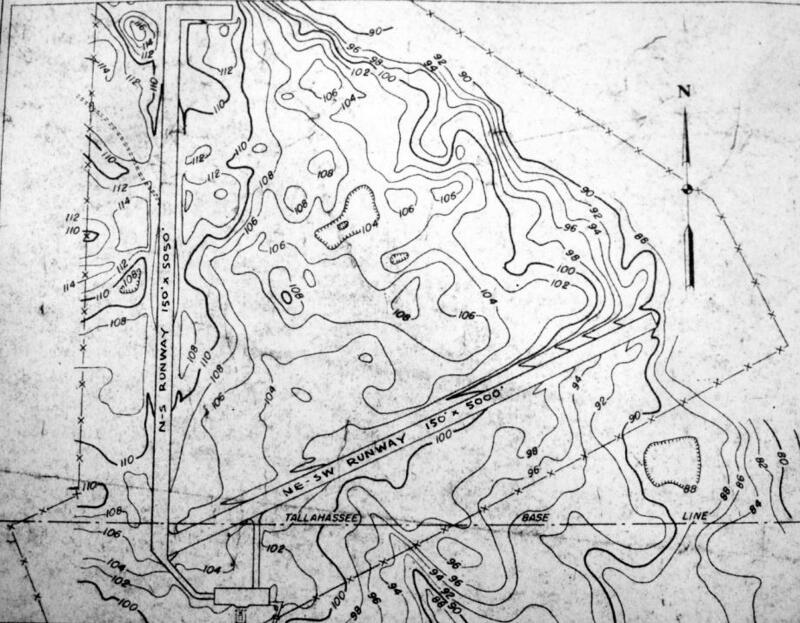 Biancur Field was not yet depicted on the 1937 USGS topo map. 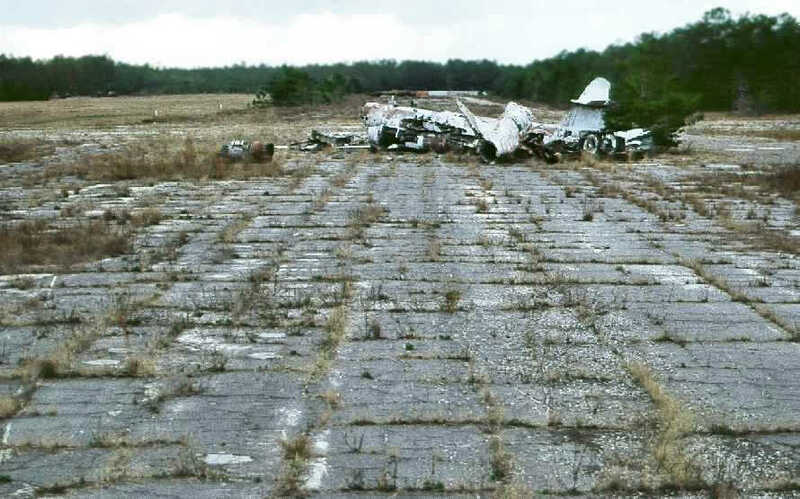 Biancur Field was one of numerous satellite airfields established to support Eglin AAF. plans for the first 3 fields [Eglin Auxiliary fields] were approved in October 1940. In May of 1941, four additional fields were started - Fields #1, #3, #5, and #6. Initially, these fields consisted of 2 paved runways, a north/south & a northeast/southwest runway each. There were not buildings at these fields. The original plan was for the planes & personnel to return to Eglin main every evening. barracks for enlisted men, officers’ quarters, an administration building, a warehouse, and a mess hall. At this point, these auxiliaries fields would become more of a sub-base rather than just an auxiliary field. Brian continued, “A 3rd runway was authorized for Auxiliary Field #4 & the other 6 gunnery fields in August 1942. All of the fields received a 3rd northwest/southeast runway. The earliest depiction which has been located of Field #6 was on the 1945 Mobile Sectional Chart (courtesy of John Voss). depicted it as having 3 paved runways with a paved ramp on the southeast side. 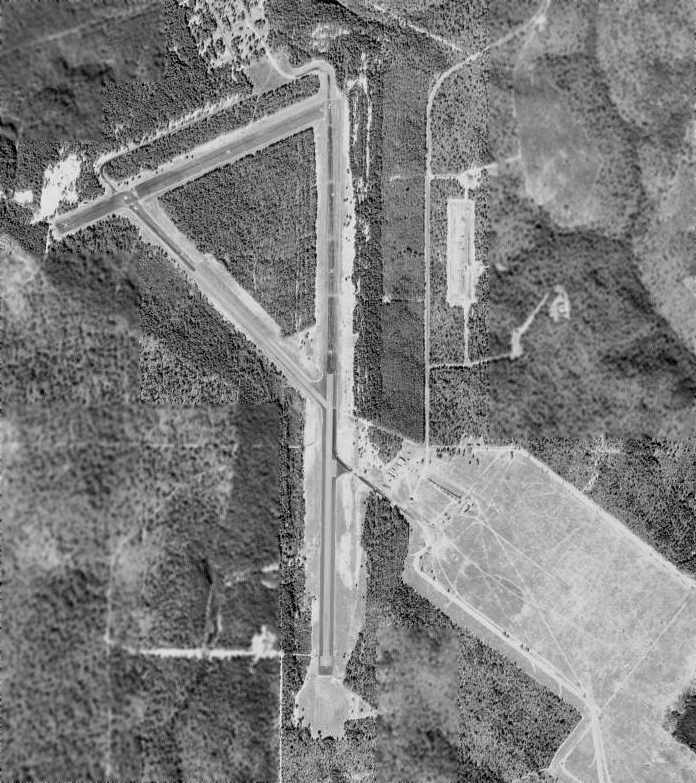 A 4/16/55 US Government aerial photo (from the University of FL online library, via Brian Rehwinkel) of Eglin Aux #6.
as the primary runway had been lengthened to 8,000'. 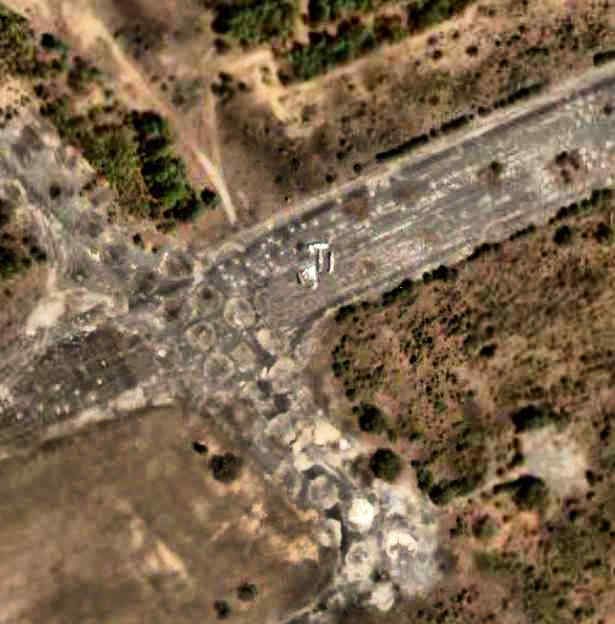 showing what appears to be a B-24 parked on the northeast/southwest runway, which was apparently closed by that point. 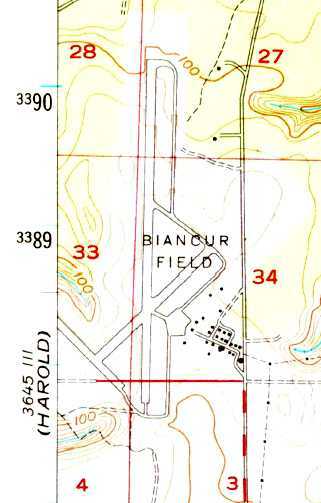 The 1956 USGS topo map depicted "Biancur Field” as having 3 paved runways, taxiways, a ramp, and a cluster of buildings on the southeast side. The 1956 Mobile Sectional Chart (courtesy of Dallam Oliver-Lee) depicted "AF #6" as having an 8,000' paved runway. 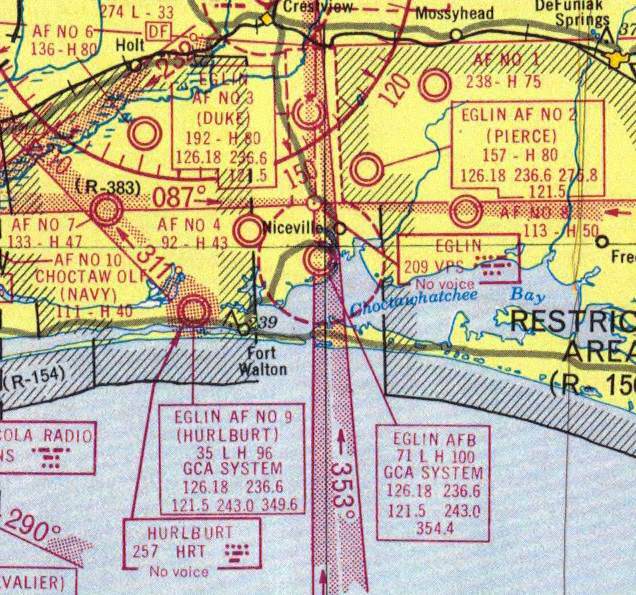 The February 1966 Mobile Sectional Chart (courtesy of David Stevenson) depicted "Eglin AF #6" as having 3 paved runways, with the longest being 8,000'. 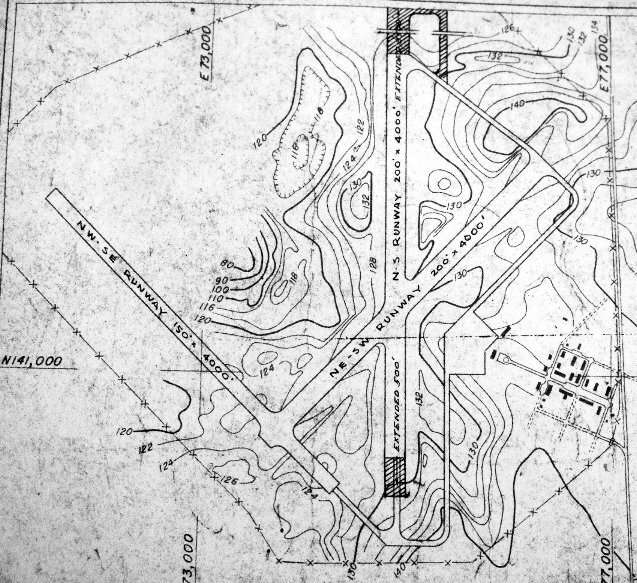 The 1973 USGS topo map depicted "Aux Field #6" as having 3 paved runways, taxiways, a ramp, and a cluster of buildings on the southeast side. There were no aircraft visible on Biancur on a 1974 aerial photo. As seen on a 1994 USGS aerial view looking northeast, Biancur's primary runway, 18/36, is 8,000' long. 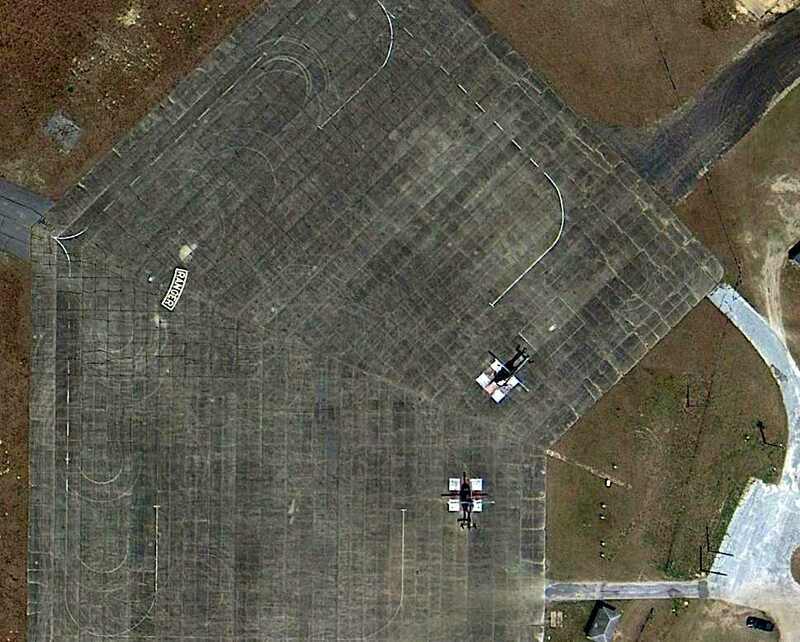 There are also 2 paved abandoned runways, taxiways, and a paved ramp. 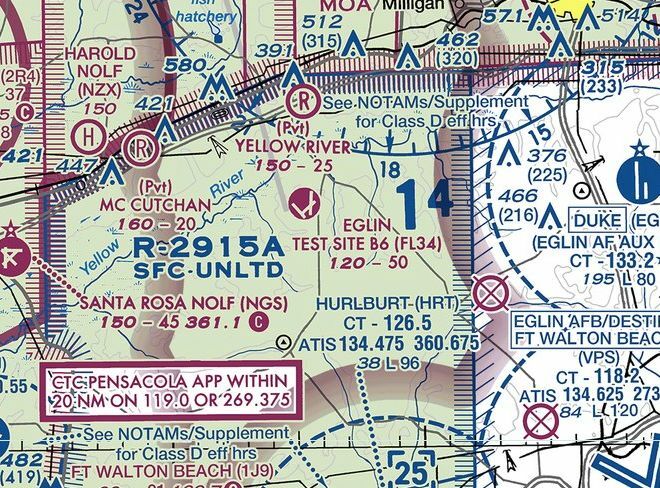 Eglin AFB & its numerous surrounding auxiliary airfields. 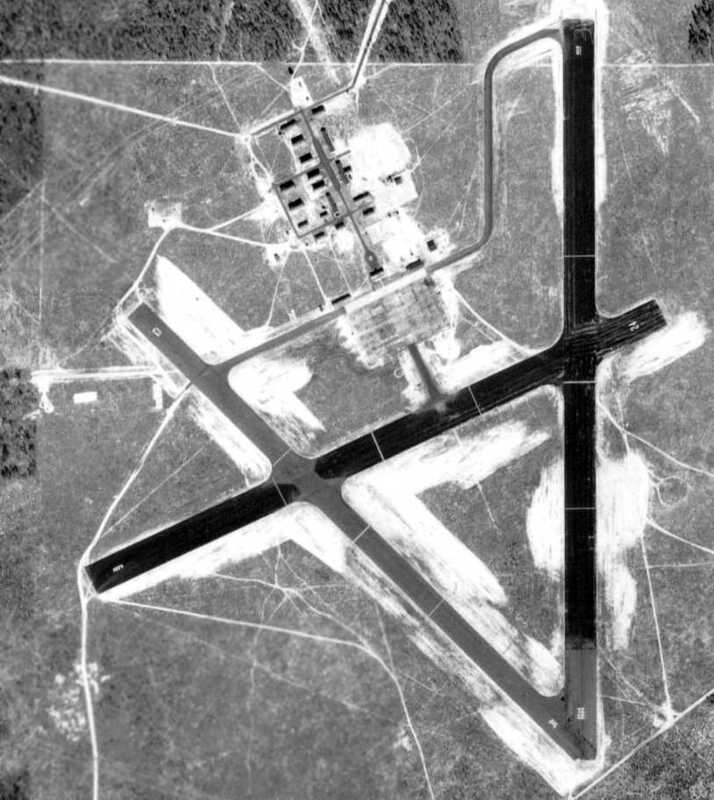 As of 2002, Biancur was still an active airfield, also known as Test Site B6. Biancur was the site of a federal prison at one time. Today it is the site of the Army 6th Ranger Training Battalion, who refer to it as Camp Rudder. 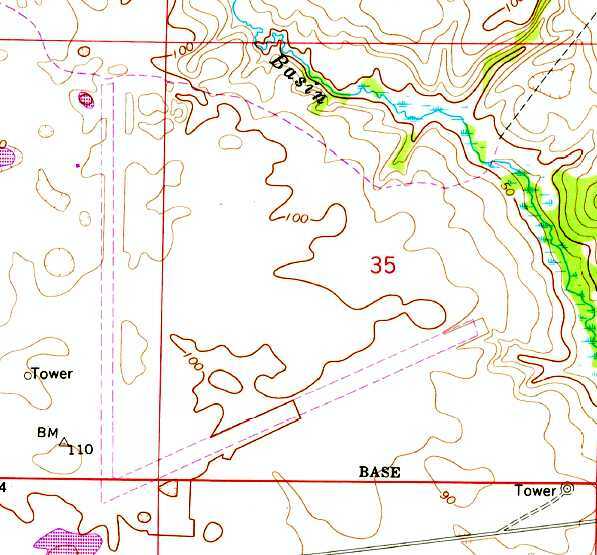 It is identified on most base maps as Tab 6 & is located just north of area B-12. A 2013 aerial view looking northeast at Biancur Field. which is painted with the “Ranger” tab. A 3/28/13 aerial photo (courtesy of Dallam Oliver-Lee) of what appears to a PZL C-145 Skytruck on a Biancur Field taxiway. 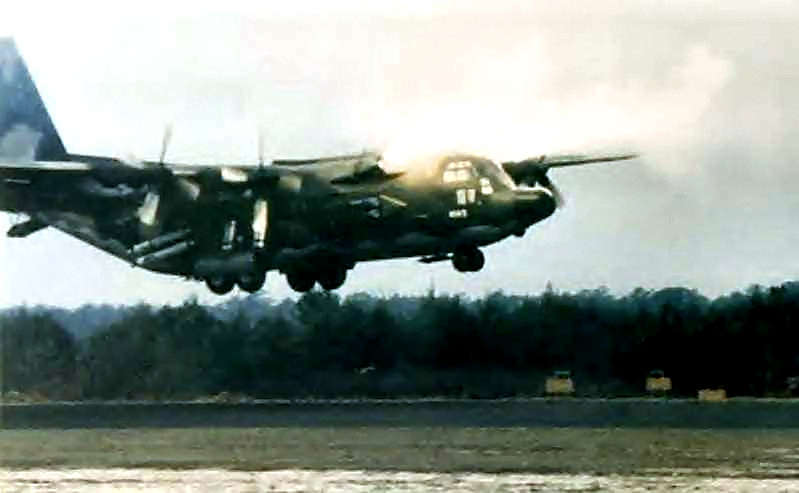 The Skytruck is a Polish STOL cargo aircraft used in small numbers by the U.S. Special Operations forces. 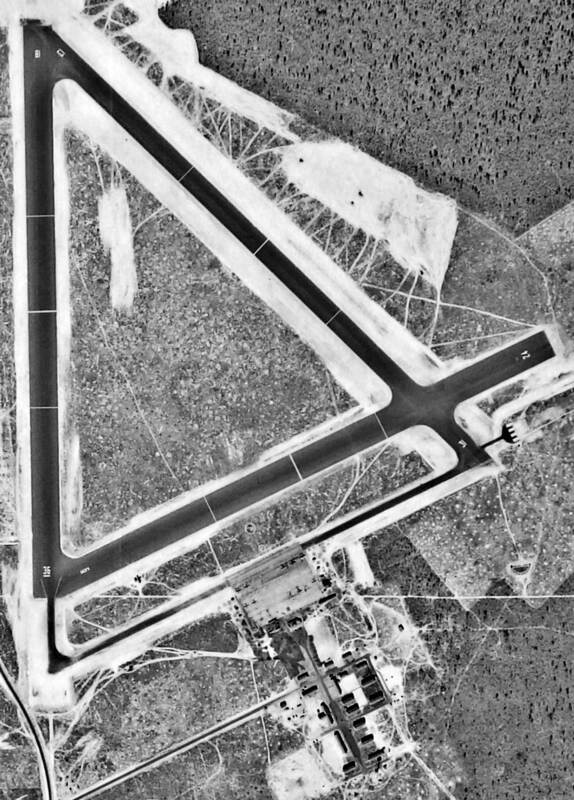 The 2016 Sectional Chart depicted "Eglin Test Site B6" as having 3 paved runways, with the longest being 5,000'. 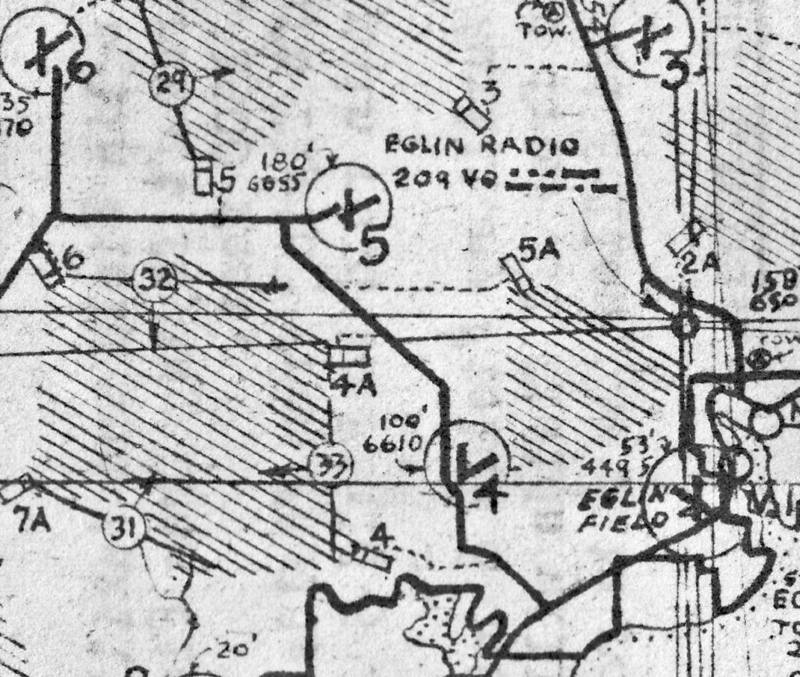 Eglin Army Airfield Auxiliary #2. as depicted on the January 1944 Mobile Sectional Chart. 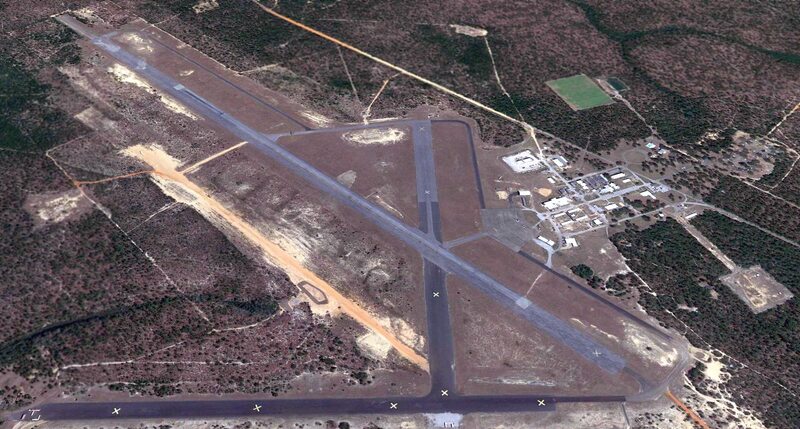 Pierce Field is one of numerous satellite airfields built during WW2 for the use of Eglin AAF. Although there was an initial proposal for 11 fields, only 3 were approved initially. These 3 fields were Auxiliary Fields #2, #4, and #7. Work began in January 1941, and work proceeded pretty slowly. Brian continued, “Initially, these fields consisted of 2 paved runways, a north/south & a northeast/southwest runway each. The earliest depiction which has been located of Eglin Auxiliary #2 was on the January 1944 Mobile Sectional Chart. 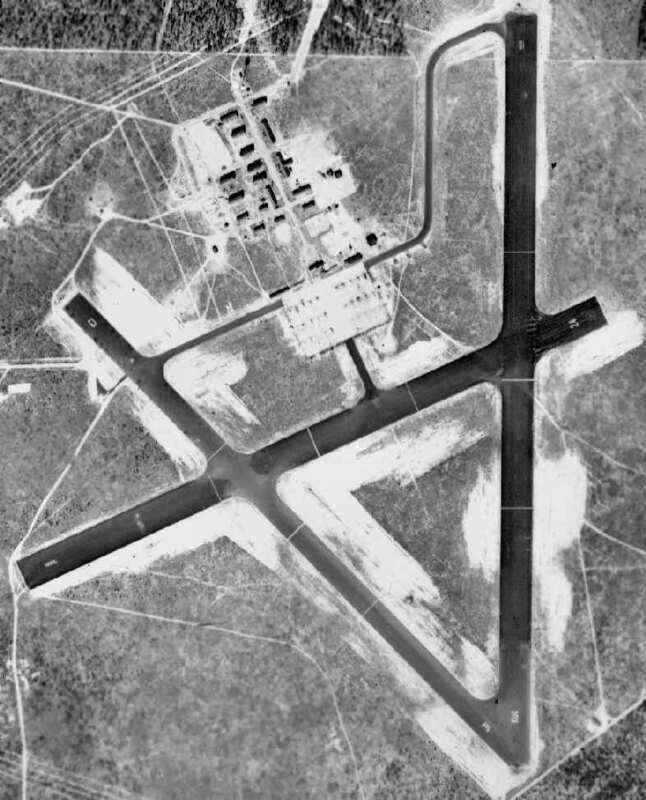 It depicted “#2” as an auxiliary airfield. depicted it as having 3 paved runways with a concrete ramp on the southeast side. Darrell Gilliland recalled, “Pierce Field (Auxiliary 2)... During the Korean War this base was used by the 4403rd Air Base Squadron, a part of the 9th Air Force. I arrived mid-January  along with 10 other new recruits (I believe it was established just before our arrival). We became a bombing & gunnery range crew & were assigned there until February 1953. The mission of the base was to train Reserve & National Guard [personnel] who would arrive for a period of 2-3 weeks to use the bombing & gunnery range. In February we all were reassigned to other duties at various locations in Europe. I believe the base was closed soon after that. 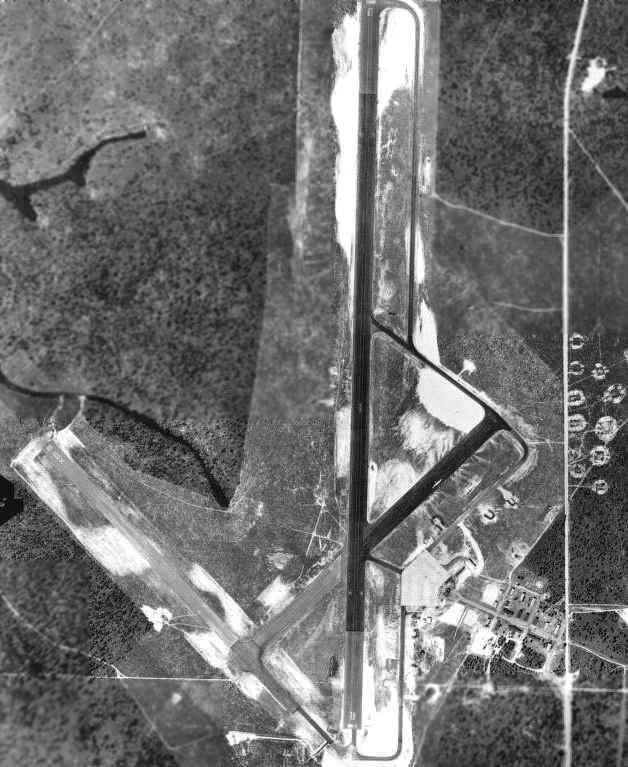 as seen on a 4/16/55 USDA aerial photo of Eglin Aux #2 (courtesy of Dallam Oliver-Lee). The reason for this runway expansion has not been determined. What may be 3 light aircraft were visible on the southeast end of the northwest/southeast runway. 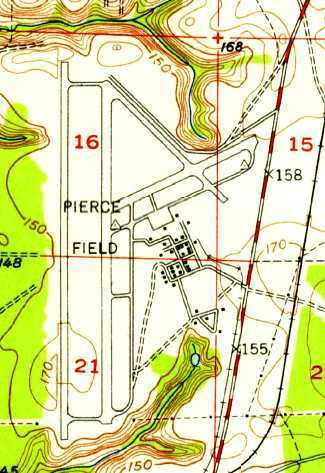 The 1956 USGS topo map depicted "Pierce Field” as having 4 paved runways, taxiways, a ramp, and a cluster of buildings on the southeast side. The 1956 Mobile Sectional Chart (courtesy of Dallam Oliver-Lee) depicted "Eglin AF #2 (Pierce)" as having a 8,000' paved runway & a control tower. 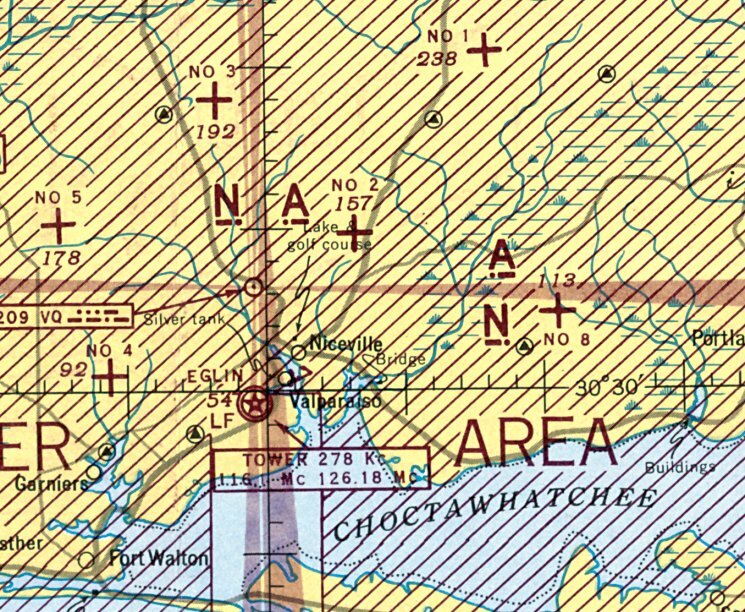 "Eglin AF #2 (Pierce)" was described on the 1964 Mobile Sectional Chart (courtesy of John Voss) as having an 8,000' hard-surface runway. 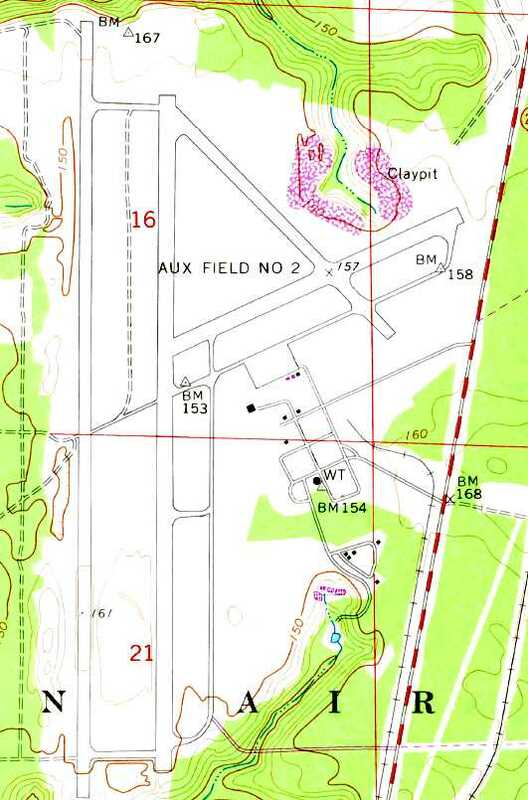 The 1973 USGS topo map depicted "Aux Field #2" as having 4 paved runways, taxiways, and a ramp. The number of buildings on the southeast side had decreased considerably as depicted on the 1956 topo map. but the eastern end of the crosswind runway showed signs of being used to test battle damage runway repair. Pierce Field was the site of one of the Vietnamese Resettlement Camps in 1975.
as that is how it was depicted on the January 1976 New Orleans Sectional Chart (courtesy of Chris Kennedy). Pierce Field was reopened at some point between 1976-2000. Pierce was still listed in the Airport Facility Directory as an active airfield until 2000, when it was listed as being closed. 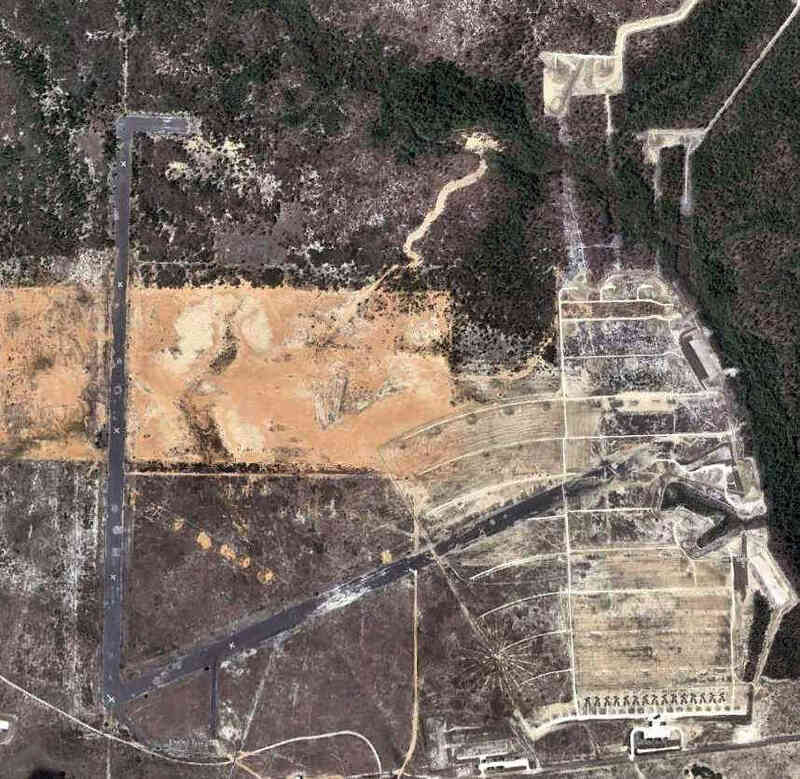 Known as Eglin Test Site C3, the installation served as the Base Installation Security Systems Test Site. 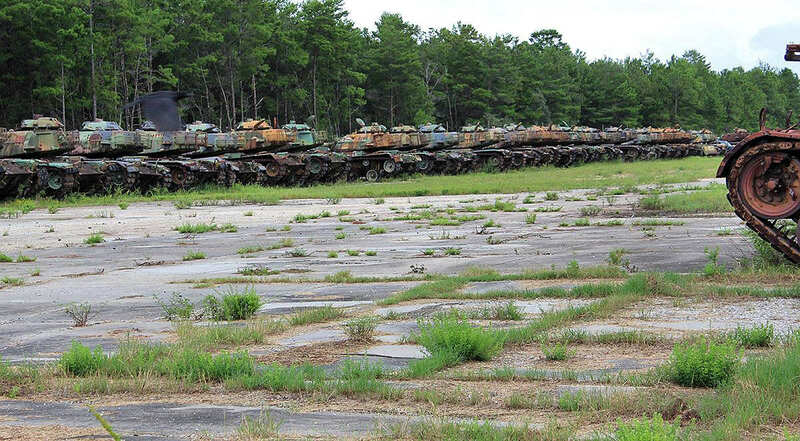 It covers 757 acres of cleared area on the Eglin Test Range. The site simulates a section of a base perimeter & a secure area within a base or installation. 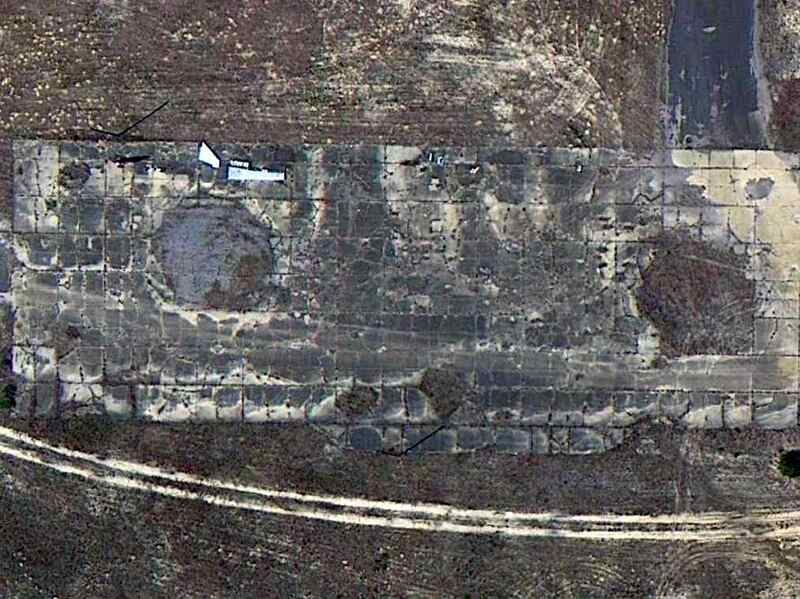 A circa 2000-2005 USGS aerial photo looking south at the numerous abandoned runways at Pierce Field. A 2/15/09 photo by Mark Sublette of 2 F-4D Phantoms sitting on the Eglin Aux #2 ramp. Mark reported, “I sleuthed around the Eglin ranges a bit. 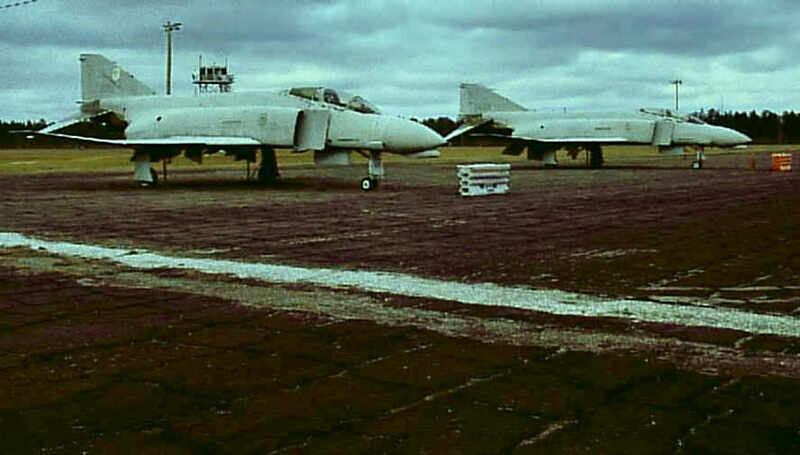 are are F-4D-33-MC, 66-8800, and F-4D-24-MC, 64-929. 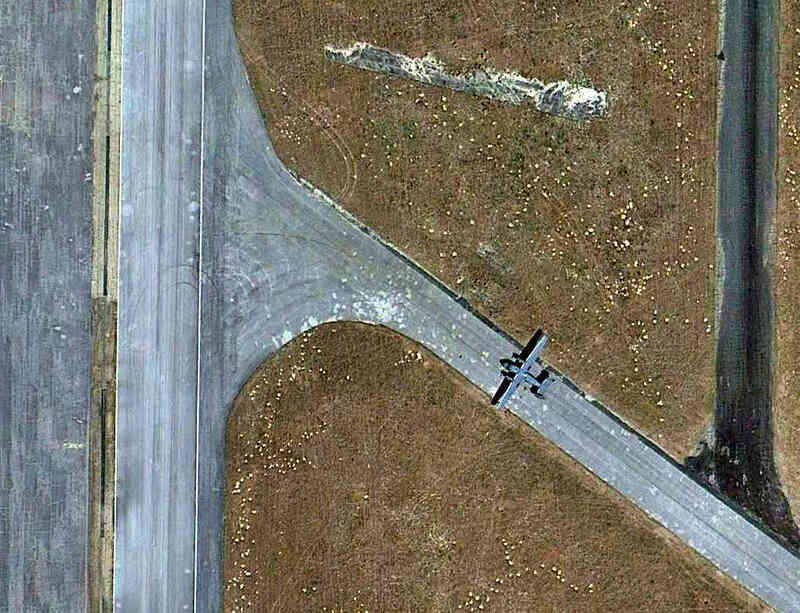 A 1/19/09 photo by Mark Sublette of a C-130A Hercules sitting on the Eglin Aux #2 ramp. and was modified to NC-130A standard. 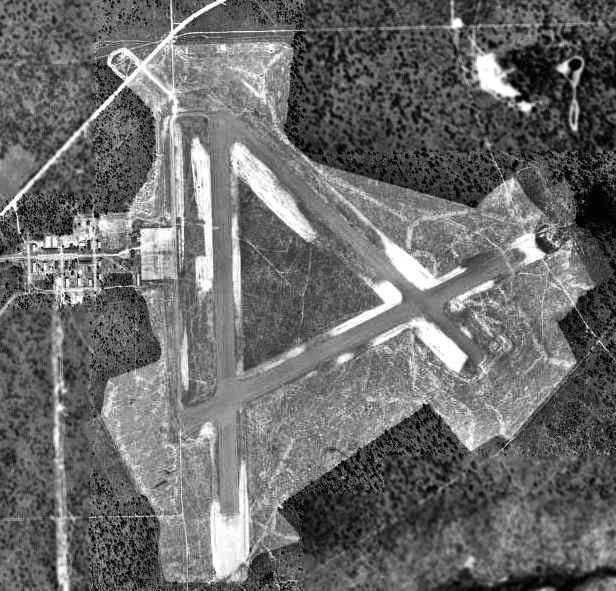 It was still in use with 46th Test Wing, Eglin AFB until 2003 & I had photographed it at Duke Field (Eglin Aux #3) in 1999. 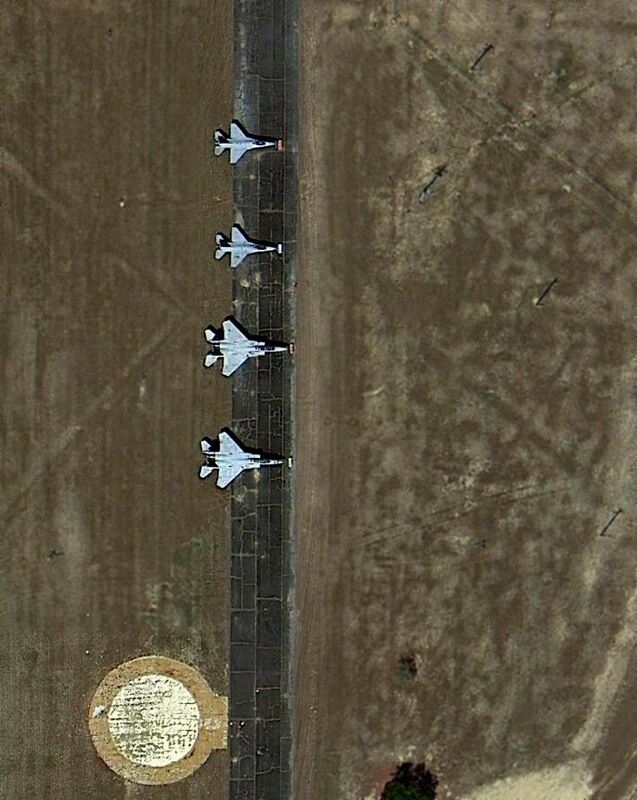 A 3/28/13 aerial photo (courtesy of Dallam Oliver-Lee) of 2 F-16s & 2 F-15s on the taxiway leading to Eglin Aux #2's Runway 36R. 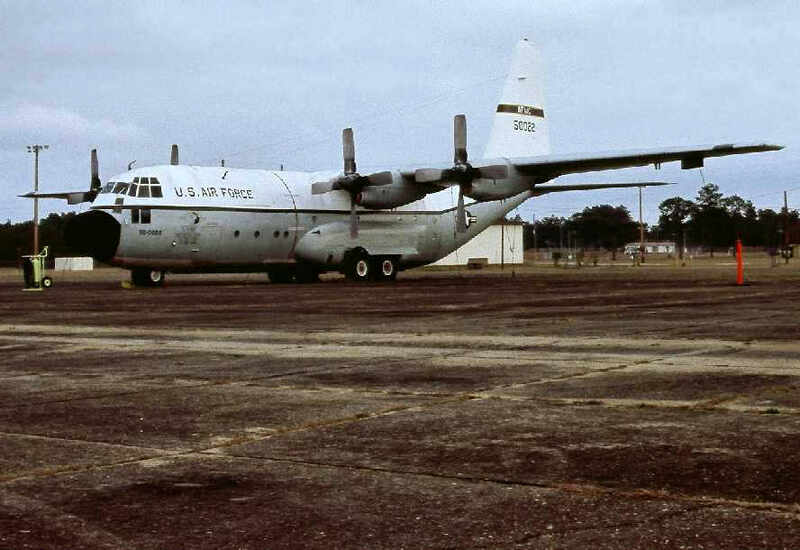 as well as a NC-130A Hercules on the ramp. A 3/13/16 photo by Daniel Shea of 2 F-4 Phantoms & a Soviet MiG-23/27 2-seater at Pierce Field. A 3/13/16 photo by Daniel Shea looking southwest at 2 F-16A/Cs, an F-15A/C, an F-15B/D, and an NC-130A. 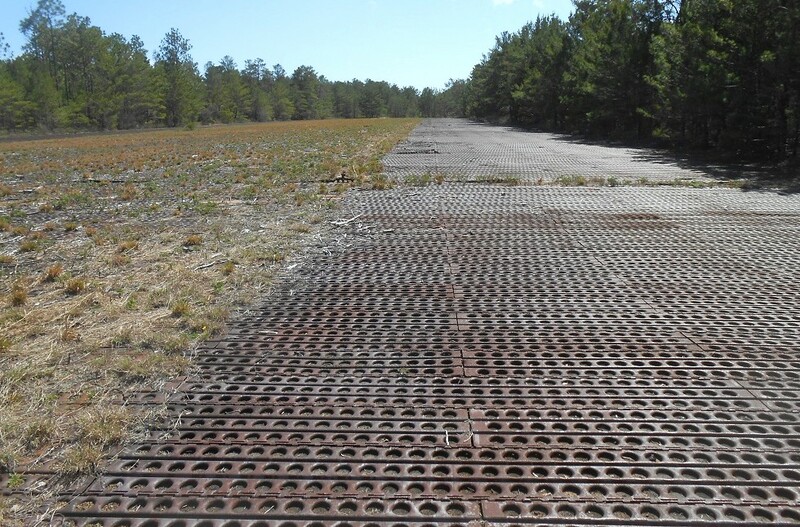 A 3/13/16 photo by Daniel Shea of Pierce Field's steel grate Runway 18R/36L. Daniel Shea reported in 2017, “Eglin Aero Modelers fly model airplanes on the south end of the main runway. You can see a black rectangle on the runway. That's where they fly. A March 9-25 1942 USAAF photo of a Doolittle Raider B-25 practicing carrier-style short takeoffs at Wagner Field in preparation for their 4/18/42 raid on Japan. 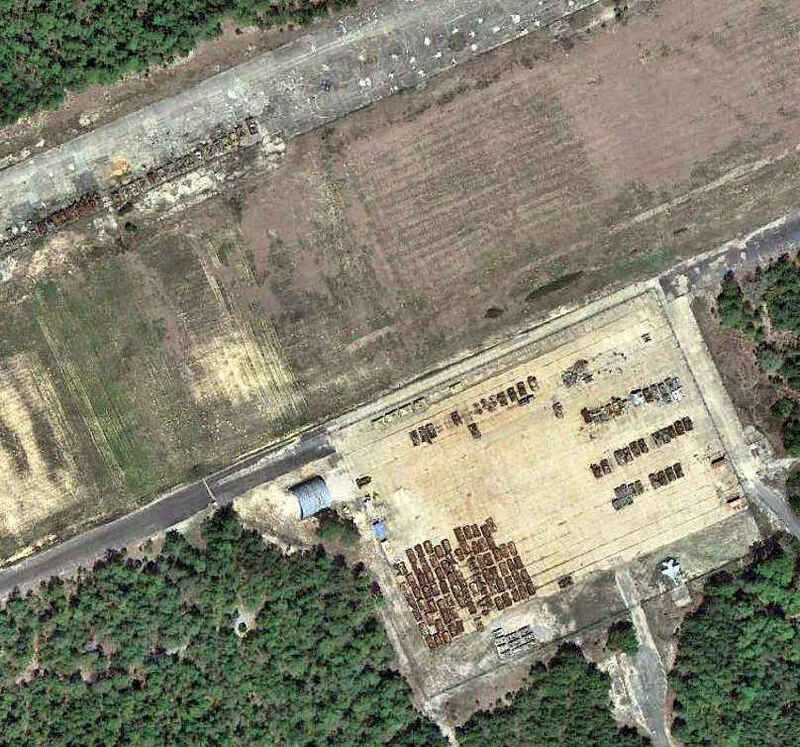 No airfield was yet depicted at this location on a 1/19/41 USDA aerial photo (courtesy of Dallam Oliver-Lee). 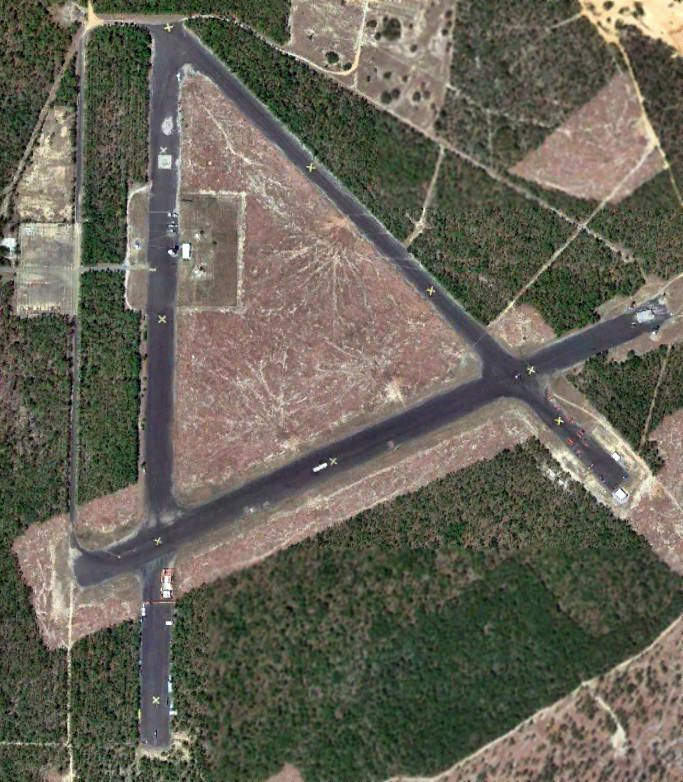 Wagner Field was established as one of numerous satellite airfields which supported Eglin AAF. of a Doolittle Raider B-25 practicing carrier-style short takeoffs at Wagner Field in preparation for their 4/18/42 raid on Japan. for their historic carrier-based B-25 bomber raid on Japan. Their training was assisted by personnel from nearby NAS Pensacola. with a taxiway leading to a ramp area at the north end of the field. but a clearing north of the ramp had a large number of buildings. 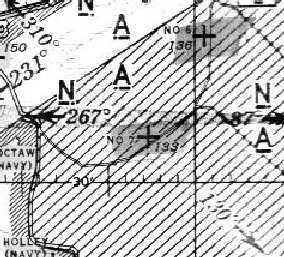 The earliest aeronautical chart depiction of Wagner Field which has been located was on the January 1944 Mobile Sectional Chart. 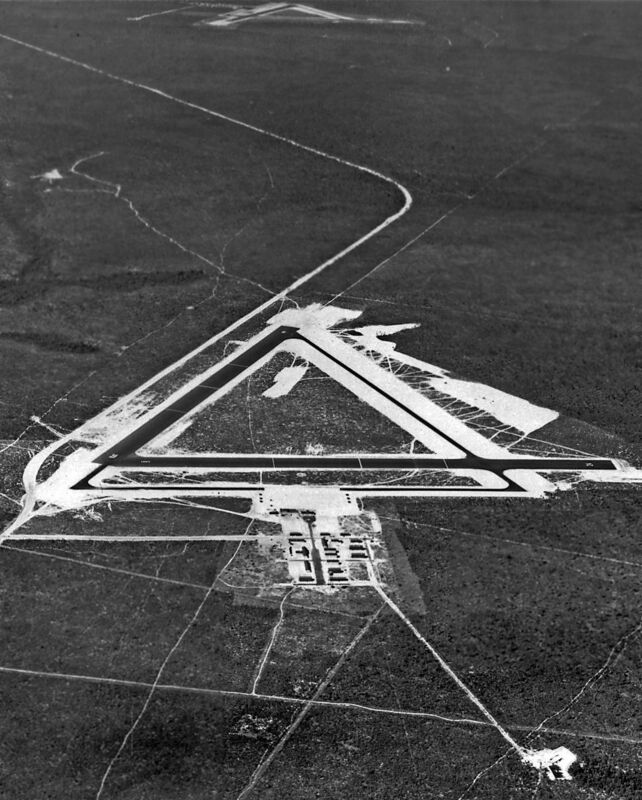 It depicted “#1” as an auxiliary airfield. the longest being the 4,000' north/south & northeast/southwest strips. but a clearing north of the ramp had a large number of buildings (or remains of buildings). and a metal launch structure was erected & used to conduct tests of German V-1 rockets. Fred Edwards recalled, "I was stationed at Eglin from 1955-57. 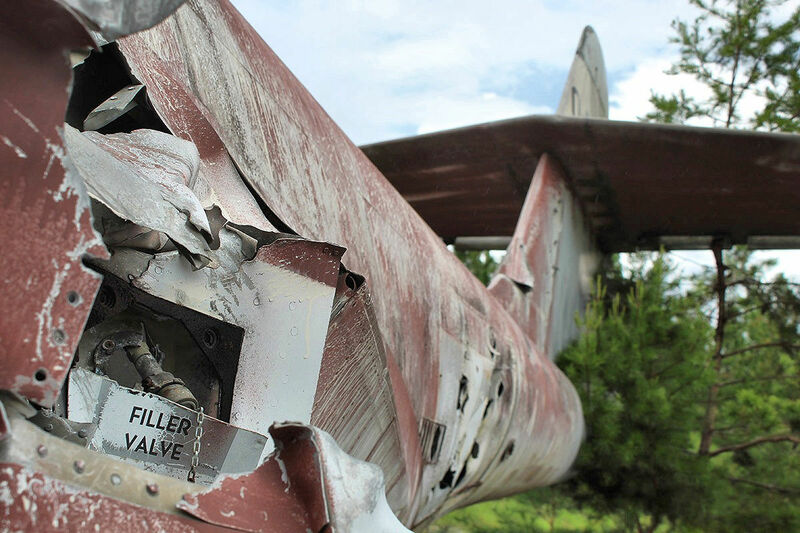 We pulled duty at an abandoned field north of Niceville for a summer tour of Navy Air Cadets. The buildings were all closed & sealed. Our job was to open & clean them out. Hindsight is great you know. 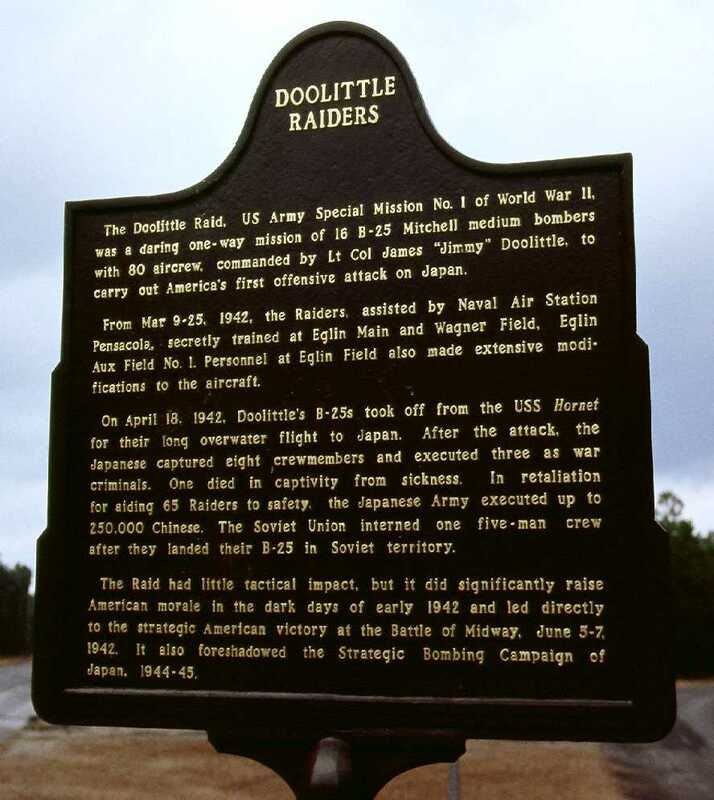 The field was used by a 'Major James Doolittle' for his raid on Japan. The landing strip area still showed signs used to approximate the deck of an aircraft carrier. I have often wished we kept just a small percentage of what we threw away." "There were several single-story barracks & offices. We cleaned out the orderly room & found numerous orders, records & notes, some signed by Doolittle. If we had only known." as that is how it was depicted on a 10/23/55 USGS aerial photo (courtesy of Dallam Oliver-Lee). The 1956 Mobile Sectional Chart (courtesy of Dallam Oliver-Lee) depicted "AF #1" as having a 7,500' paved runway. 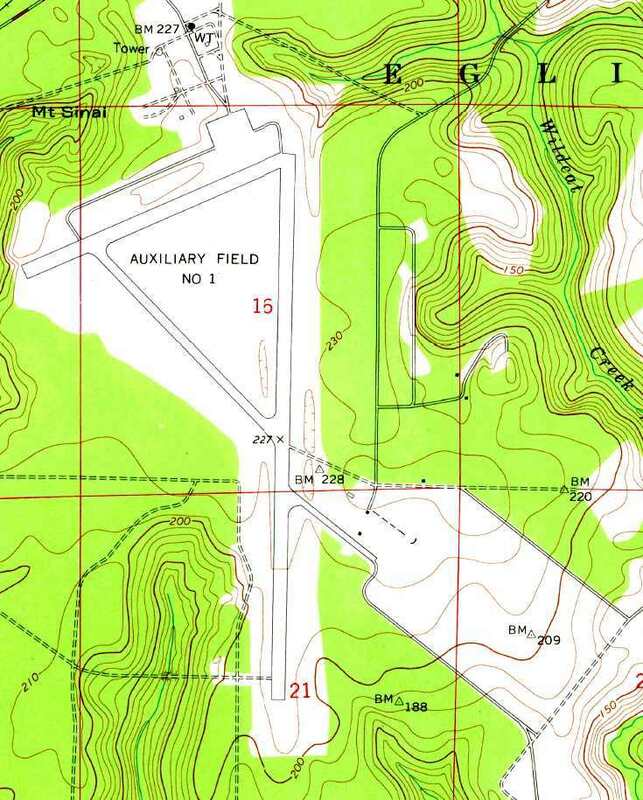 The 1973 USGS topo map depicted "Auxiliary Field #1" as having 2 paved runways, taxiways, and a ramp. There were no aircraft visible on Wagner on a 1974 aerial photo. 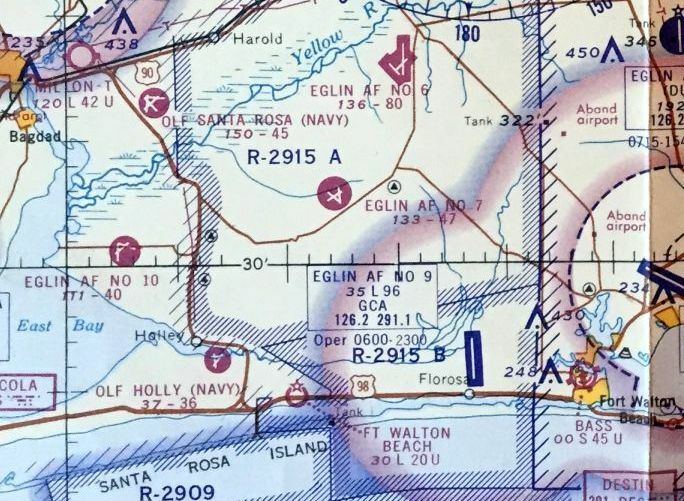 "Eglin AF #1" was still depicted as an active airfield on the 1980 New Orleans Sectional Chart, with a 7,500' paved runway. firing its downward-facing rockets in a test of its STOL capabilities at Wagner Field. conceived as an urgent response to the Iranian Hostage Crisis & the unsuccessful attempt to rescue the hostages. According to Tim Rathbone, “Wagner Field was the test site of the Credible Sport program from August-October 1980.
for a planned 2nd hostage rescue mission to Iran. and was designed to validate short takeoff & landing approach configuration & associated avionics. The airframes for CS Phase 1 were tested in September-October 1980. The original CS1 aircraft was a single-point design & only explored a limited portion of the flying envelope. The CS1 aircraft were designed for a specific, limited mission. 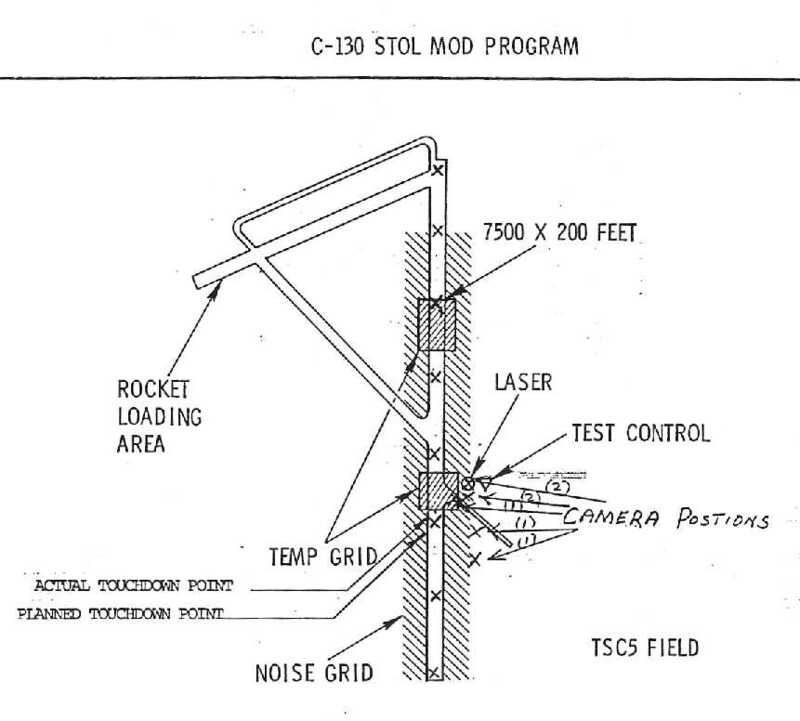 A 1980 diagram (courtesy of Tim Rathbone) of the facilities at Wagner field used to test the prototype YMC-130H Credible Sport 1.
with the intention of extracting the American hostages from the Embassy. After rescuing the hostage these aircraft were to land on the USS Nimitz aircraft carrier in the Persian Gulf. (specifically the Amjadien or Amjadieh soccer stadium across the street from the embassy). and fire approximately 6 inches from the ground for reverse-thrust augmentation. and 2 on the rear fuselage forward of the beaver tail to prevent over-rotation of the airframe. a dorsal fin was fitted on the rudder spine, the flaps were double-slotted, and the ailerons were extended. An In-flight refueling pod from a C-141 was installed on the fuselage centerline. Tim continued, “Avionics modifications were as follows: A DC-130 type radome with a FLIR turret was installed on the nose. pointing forward & downward on the forward & rear fuselage. This was the 1st airframe modified. It was tested at Wagner Field. It flew approximately 4 test flights there. 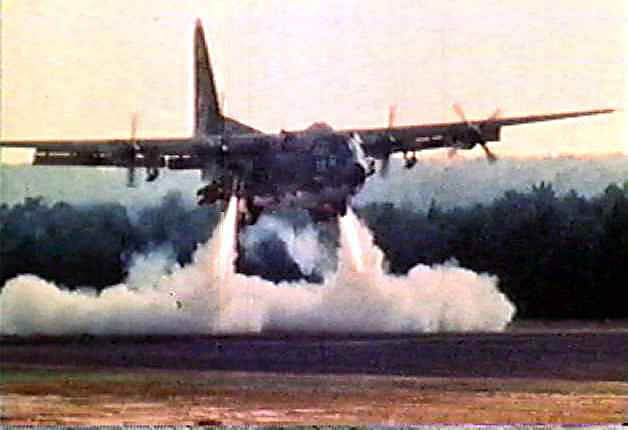 firing its forward-facing retrorockets in a test of its STOL capabilities at Wagner Field. 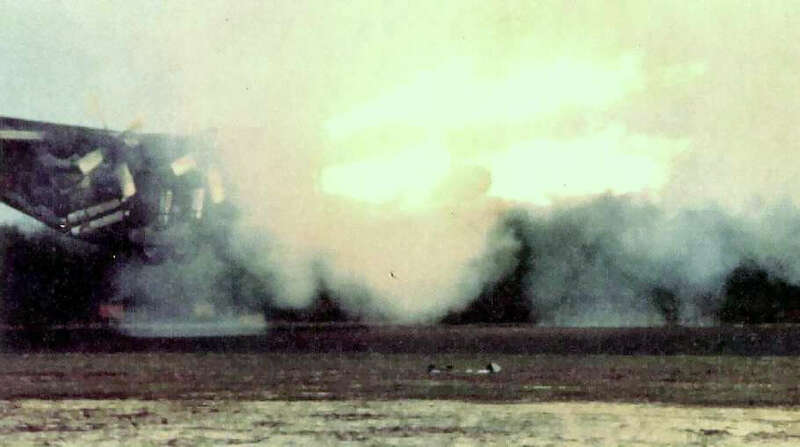 violently firing its forward-facing retrorockets in a test of its STOL capabilities at Wagner Field. 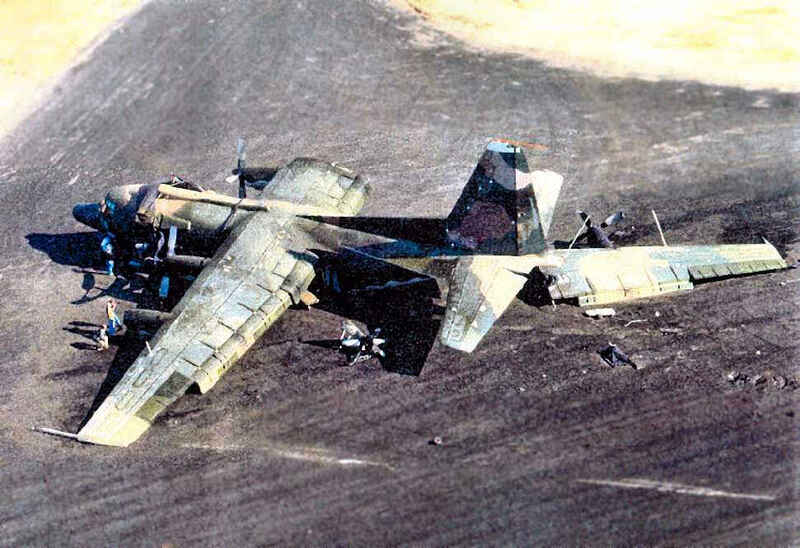 after its crash at Wagner Field caused by improper timing of the firing of its retrorockets. 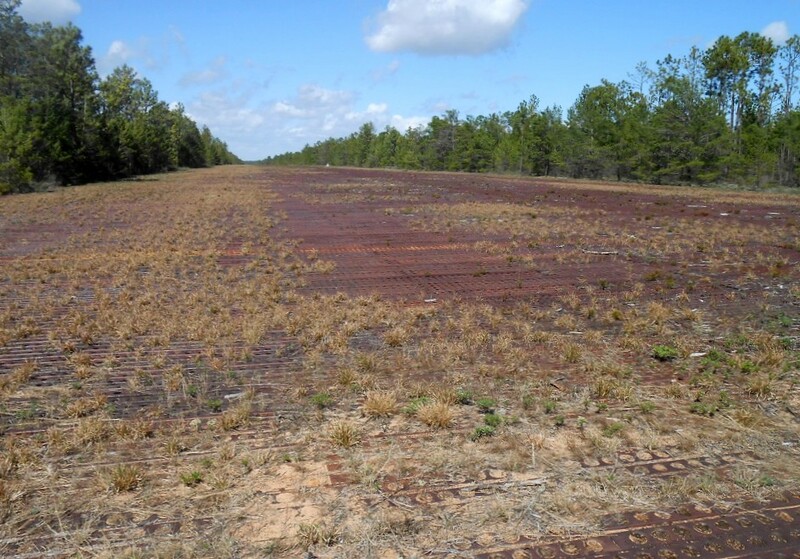 the remains of 3 paved runways still exist (the longest is 8,000' long). The metal launch structure used for post-WW2 tests of German V-1 rockets was still visible, at the top of this cleared area. particularly for airdrops of troops & equipment. 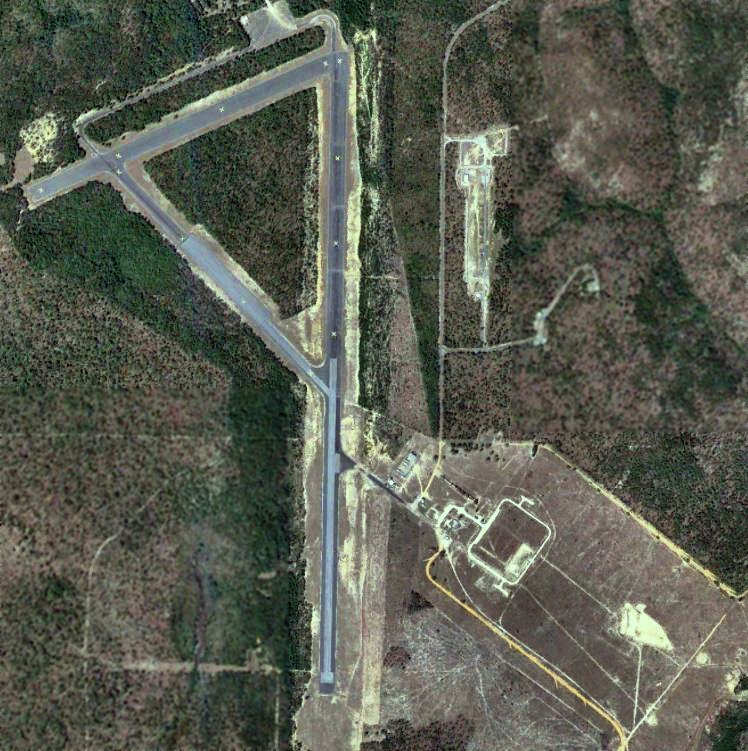 It is also known as Eglin Test Site C5. supporting some Unmanned Aerial Vehicle test flights at the C-5 (Auxiliary Field #1) test site. At C-5 there is only one building, a 3 story control tower, that looks like it could date back to the 1940's. All the other structures are trailers & a hangar of modern construction. The rusting metal launch ramp [used for post-WW2 V-1 rocket tests] is still there. commemorating its use by Jimmy Doolittle during WW2. A 3/28/13 aerial photo (courtesy of Dallam Oliver-Lee) showed the Wagner airfield remaining in good shape. Notably all 3 of the runways were marked with closed-runway “X” markings except for the southern half of the north/south runway. 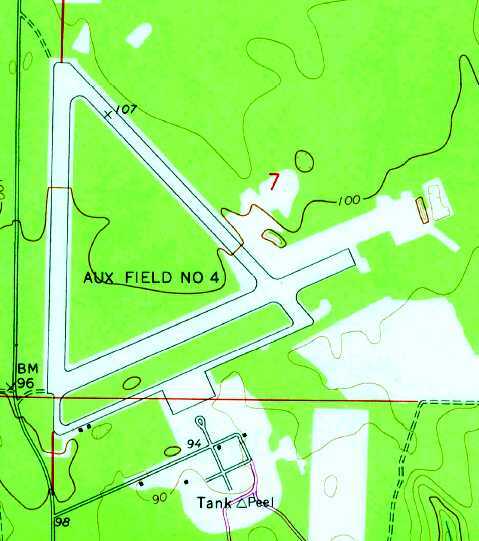 The Eglin Aux #7 airfield as depicted on the 1945 Mobile Sectional Chart (courtesy of John Voss). 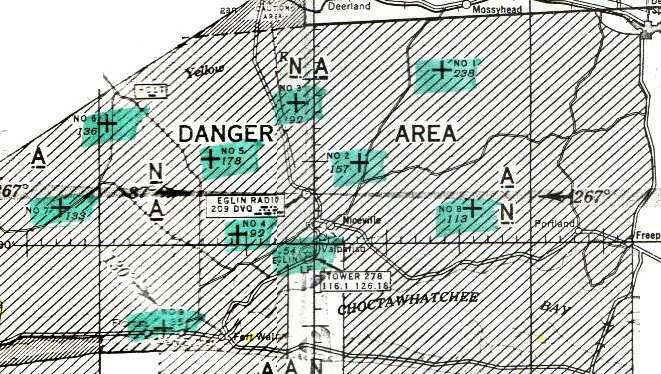 No airfield was yet depicted at this location on the 1938 USGS topo map (courtesy of Dallam Oliver-Lee). 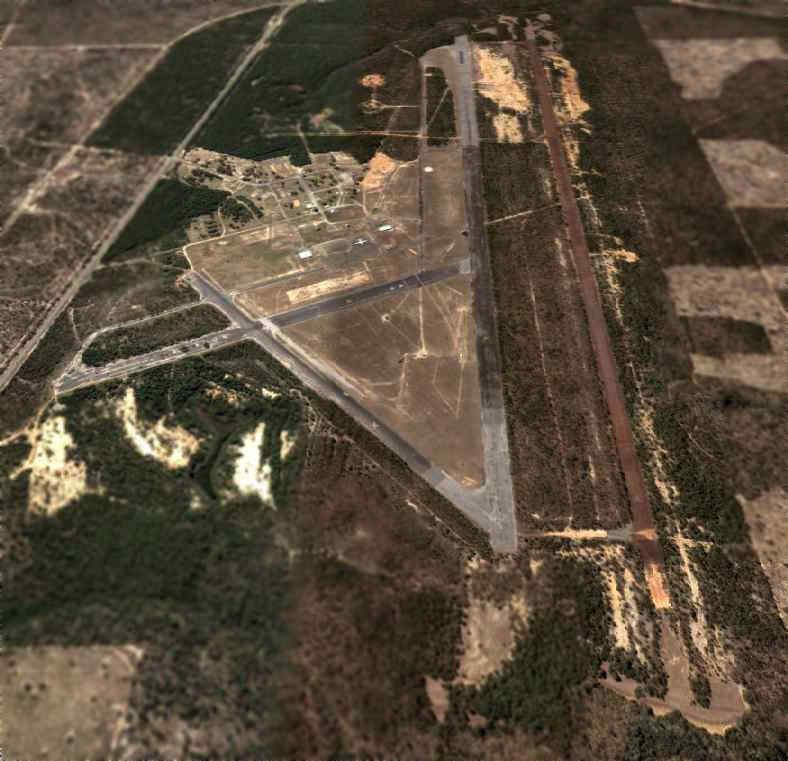 Epler Field was established as one of numerous satellite airfields which supported Eglin AAF. By October 1941, according to this document, only one field, Auxiliary Field #2, was substantially complete. The beginning of the war obviously lit a fire under the construction process because by latter part of December Fields #4 & #7 were complete. The proving grounds history also makes note of the oddity that Field #7 was included as one of the first fields built. The earliest depiction which has been located of Epler Field was on the 1945 Mobile Sectional Chart (courtesy of John Voss). The earliest photo which has been located of Epler was a 1/18/46 aerial view (from the U of FL Libraries). It depicted the field as having 3 asphalt runways, paved taxiways, ramps, and a number of buildings. 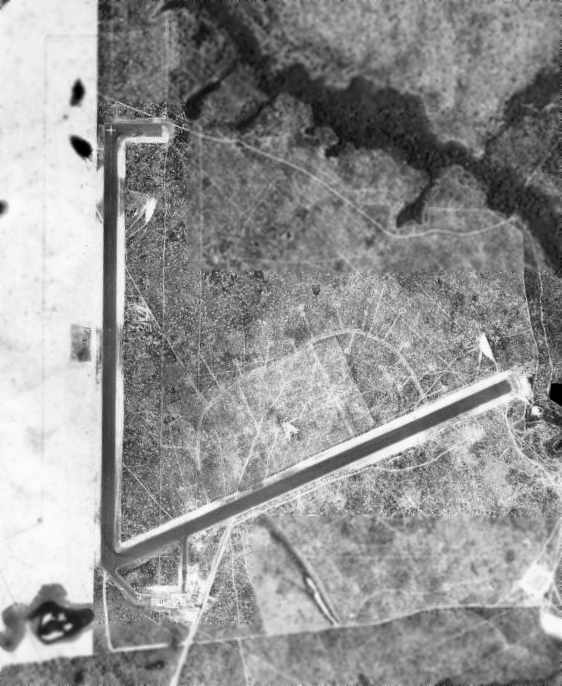 A January 1949 aerial view of Eglin Aux #7 (US Government photo, courtesy of the FL DOT, via Brian Rehwinkel). There may be one or 2 aircraft parked on the apron. 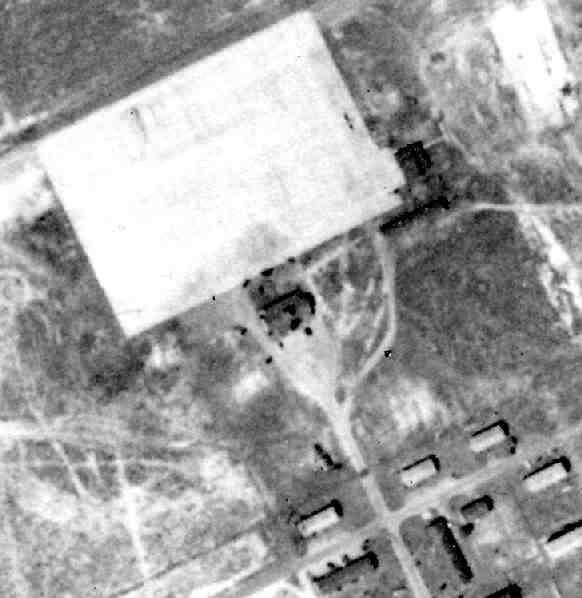 Note the number of barracks or administrative buildings, north of the airfield. depicted it as having 3 paved runways with a paved ramp on the northwest side. 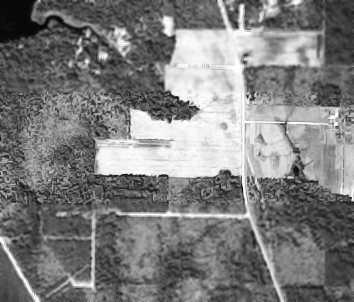 There were no aircraft visible on Epler on a 1955 aerial photo. The 1956 Mobile Sectional Chart (courtesy of Dallam Oliver-Lee) depicted "AF #7" as having a 4,700' paved runway. 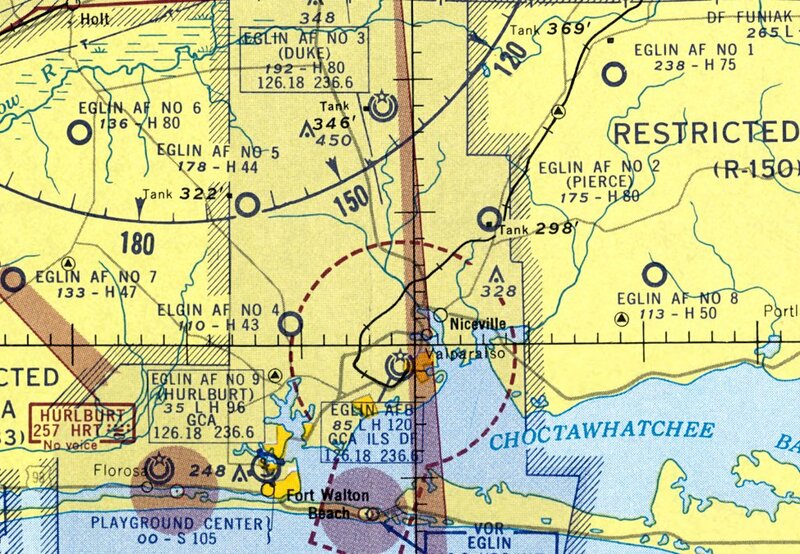 The February 1966 Mobile Sectional Chart (courtesy of David Stevenson) depicted "Eglin AF #7" as having 3 paved runways, with the longest being 4,700'. 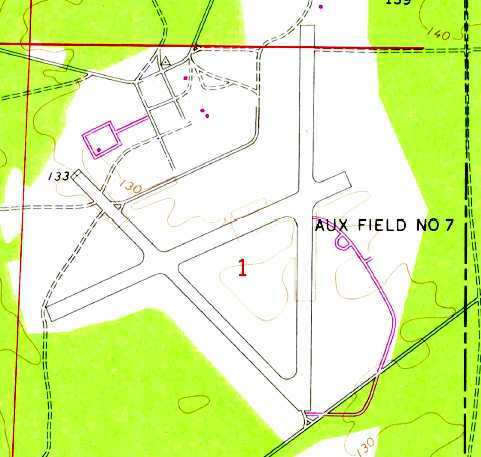 The 1970 USGS topo map depicted "Aux Field #7" as having 3 paved runways. 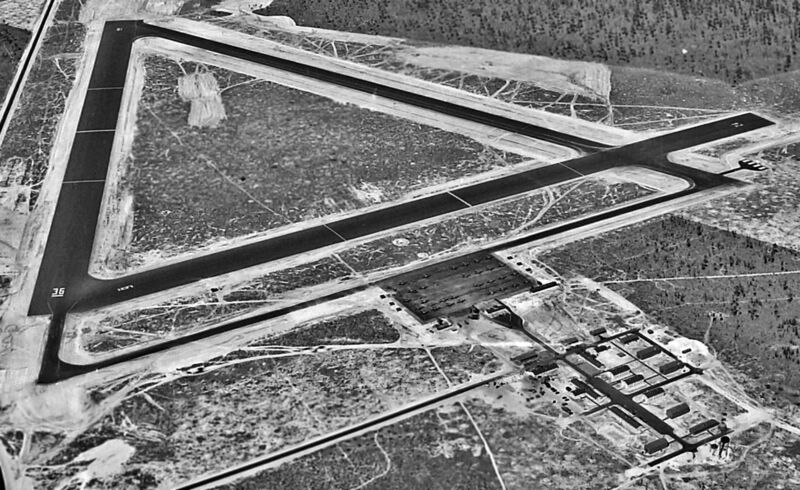 A 1974 aerial view showed that the north/south runway had been repaved in concrete at some point between 1955-74.
and described as having a 4,700' hard-surface runway. the airfield consists of 3 paved runways (the longest, 18/36, is 5,200' long). Epler Field was officially closed as an airfield at some point between 1976-2000. 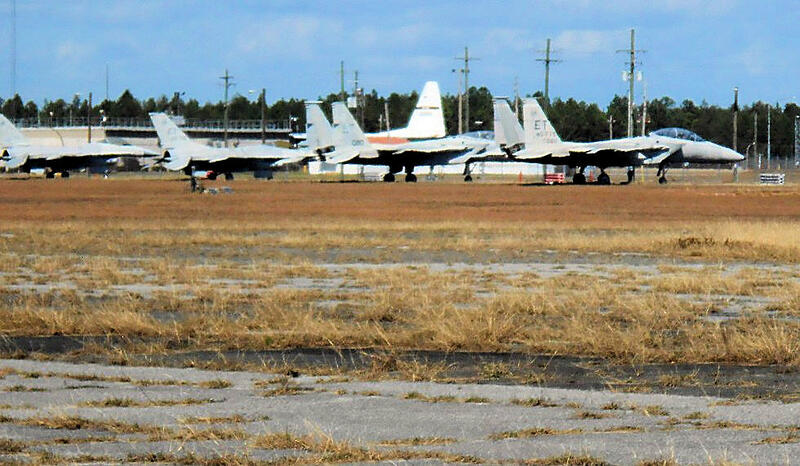 Epler is still an operating airfield that is used to support special operation activity within the Eglin complex. It is also known as Test Area B-12. A 2005 USGS aerial picture looking northeast at Epler Field. A 3/28/13 aerial photo (courtesy of Dallam Oliver-Lee) of 2 F-101 Voodoos & an F-4 Phantom on the Epler Field ramp. 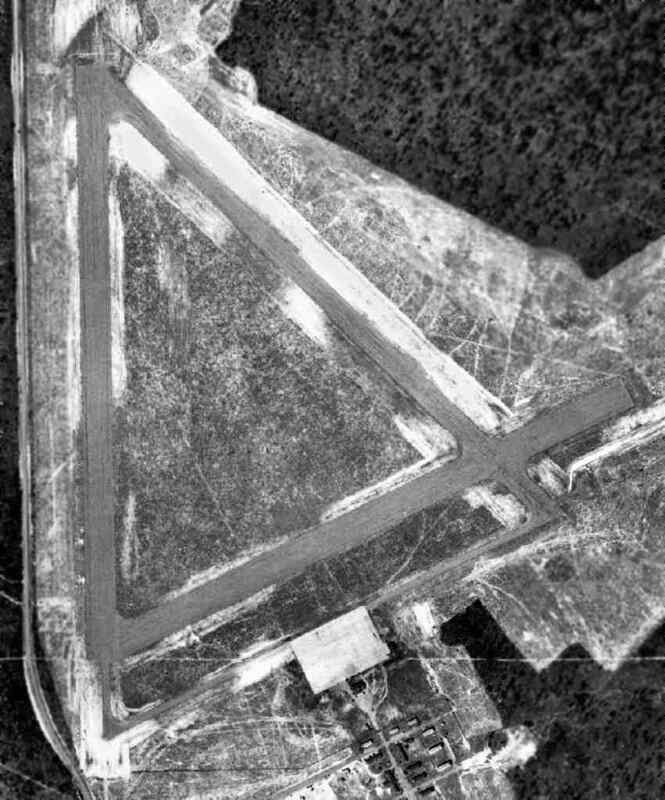 A 3/28/13 aerial photo (courtesy of Dallam Oliver-Lee) of a delta-wing fighter (either an F-102 or F-106) next to the northeast end of Epler Field's Runway 13. Eglin Auxiliary Army Airfield #8, as depicted on the January 1944 Mobile Sectional Chart. 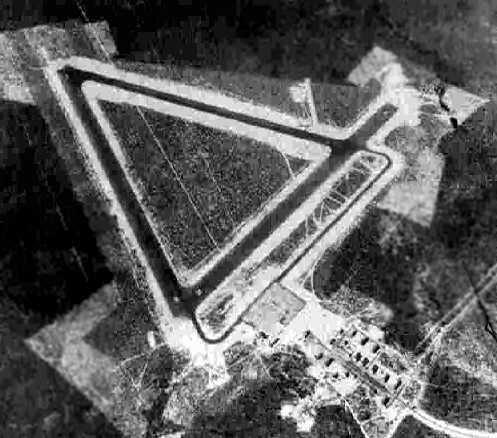 Baldsiefen Field is one of numerous satellite airfields built during WW2 for the use of Eglin AAF. as it was not yet depicted on a 1941 aerial photo or the June 1942 Mobile Sectional Chart. 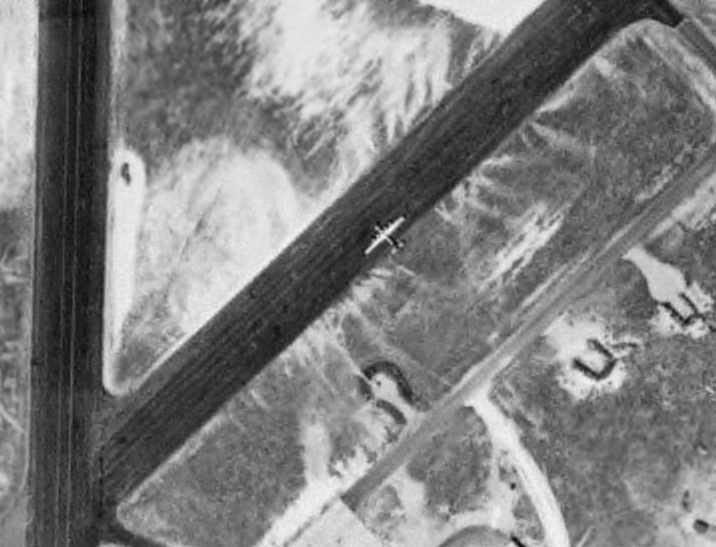 which depicted “#8” as an auxiliary airfield. 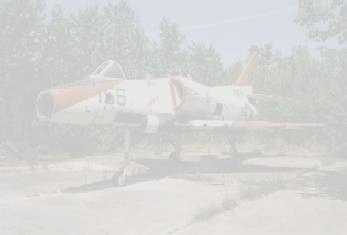 It was not apparent if the field was still in use, as there were no aircraft visible on the field. as well as 2 taxiways leading to a small ramp at the south end of the field. 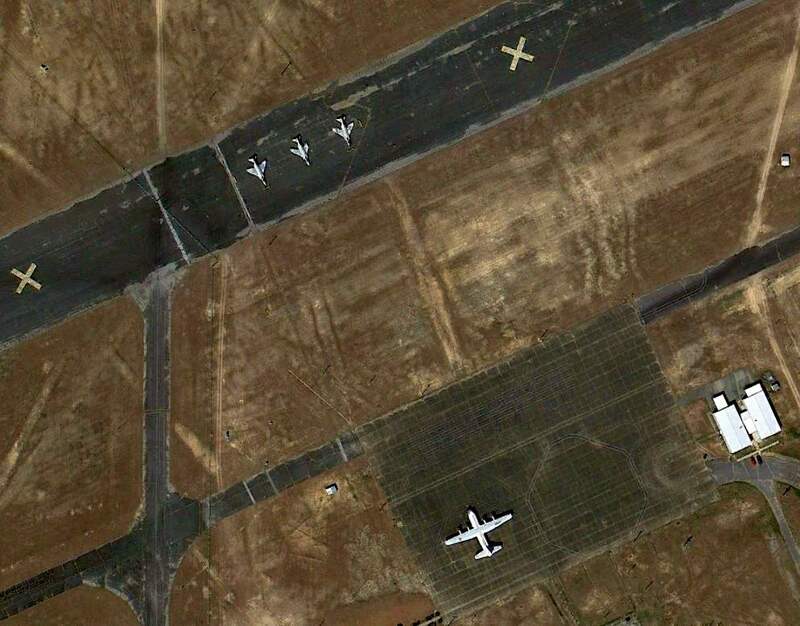 Note the network of dispersal aircraft parking pads visible to the north of the northeast/southwest runway. depicted it as having 2 paved runways with a paved ramp on the south side. 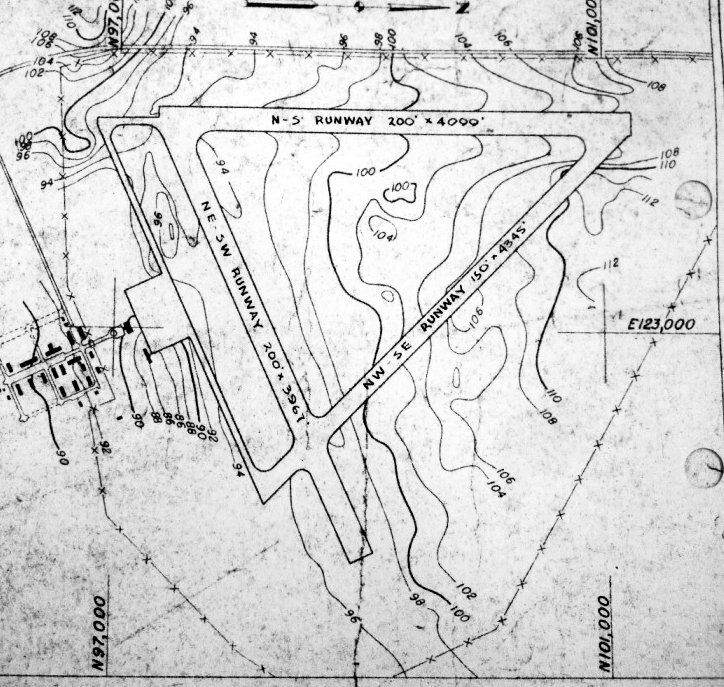 The 1956 USGS topo map depicted Baldsiefen Field as having 2 paved runways, taxiways, and a ramp at the southwest corner. 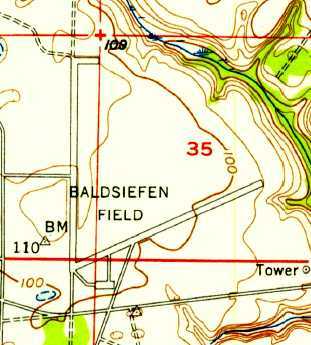 The last aeronautical chart depiction which has been located showing Baldsiefen Field still open was on the March 1960 Mobile Sectional Chart. 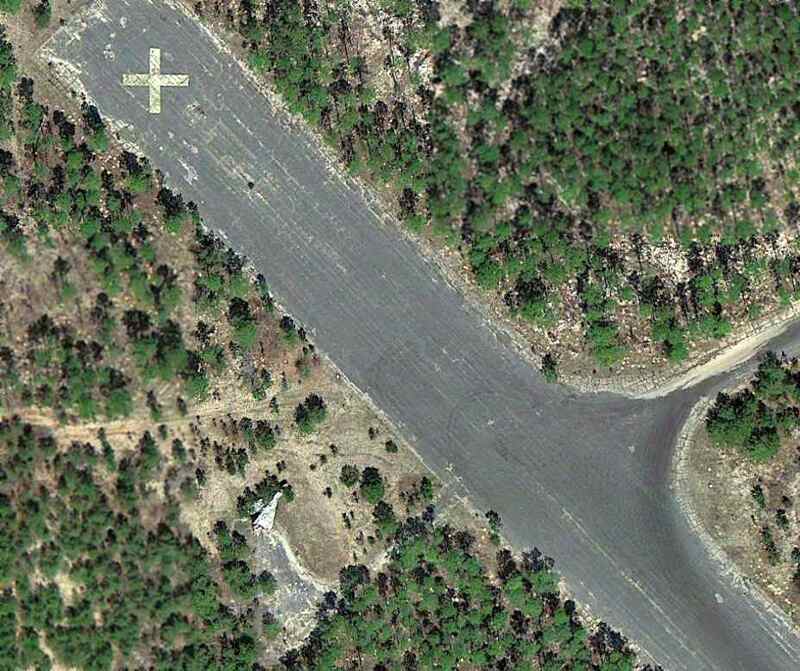 It depicted "Eglin AF #8" as having a 5,000' paved runway. as that is how it was labeled on the 1964 Mobile Sectional Chart (courtesy of John Voss). It was described as having a 5,000' hard-surface runway. 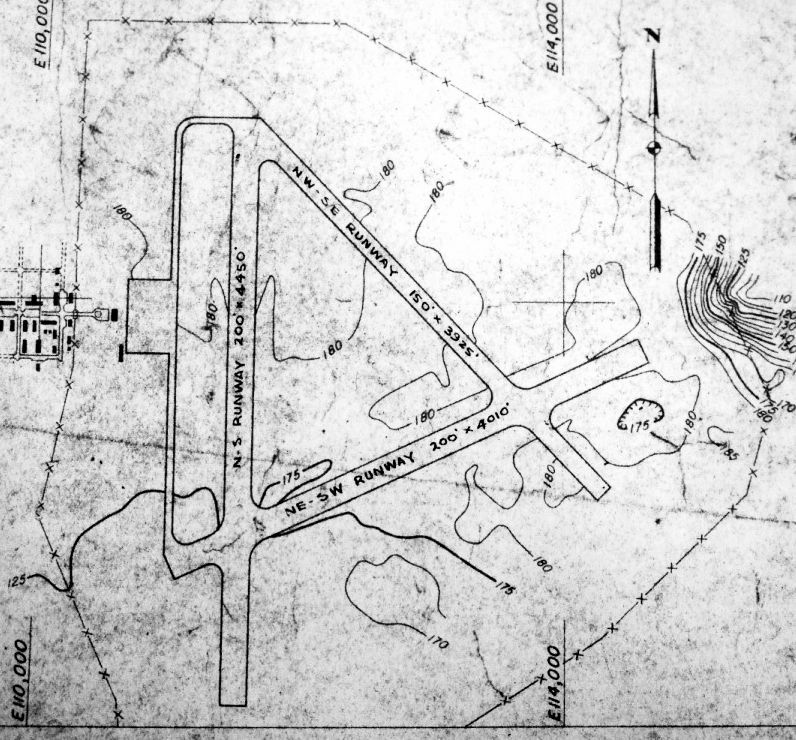 The 1970 USGS topo map depicted 2 unpaved runways, without labeling the airfield at all. so the field may have been used for target practice or runway battle damage repair. originally located to the north of the northeast/southwest runway. 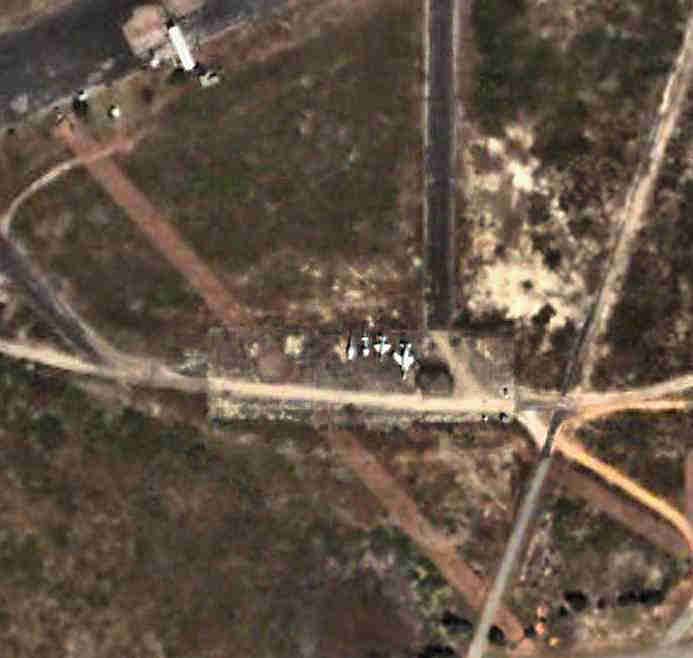 but both runways appeared to have been cratered along several portions. Baldsiefen is located in an area of the Eglin base called Range 52.
cargo extractions, air assault landings & parachute drops. including an A-4 Skyhawk & an F-4 Phantom. A 3/28/13 aerial photo (courtesy of Dallam Oliver-Lee) showing the effect of numerous bomb hits on Baldsiefen Field. 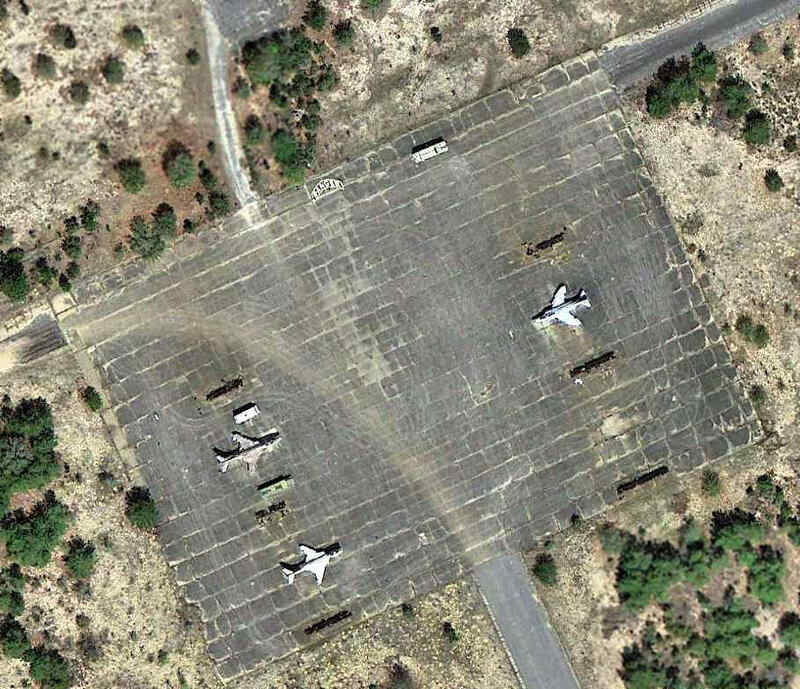 A 3/28/13 aerial photo (courtesy of Dallam Oliver-Lee) of the Baldsiefen ramp, showing all that remains of the F-4 Phantom & an unidentified aircraft. The earliest aeronautical chart depiction which has been located of Eglin Auxiliary #5 was on the January 1944 Mobile Sectional Chart. Piccolo Field as it was not yet depicted on the 1937 USGS topo map (courtesy of Dallam Oliver-Lee). 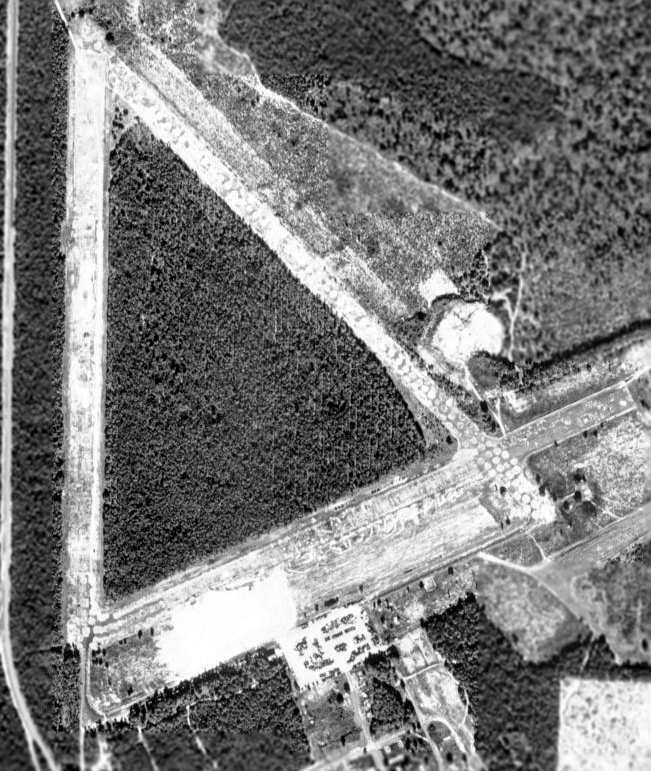 Piccolo Field was established as one of numerous satellite airfields which supported Eglin AAF. The earliest depiction which has been located of Eglin Auxiliary #5 was on the January 1944 Mobile Sectional Chart. was a 4/16/55 U.S. Government aerial photo (from the University of FL online library, via Brian Rehwinkel). It was not apparent if the airfield was still in use. 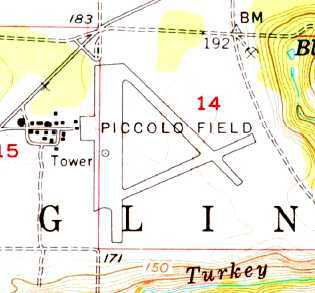 The 1956 USGS topo map depicted Piccolo Field as having 3 paved runways, a large ramp along the west side, and a large number of buildings. unlike most of the other Eglin Auxiliary fields.. It was described as having a 4,400' hard-surface runway. who traveled & worked airstrikes at some of those fields. I spent an awful lot of time down there over the years training with AC-130 gunships. It was always easier to travel to the airplane for training than trying to bring the airplane you. Those guys are perpetually busy. and it was either an early Saturday or Sunday morning. it was a simulated airfield take-down scenario. and did an assault landing right in front of us. Sure got our attention but then the Talon became a target of opportunity for us. 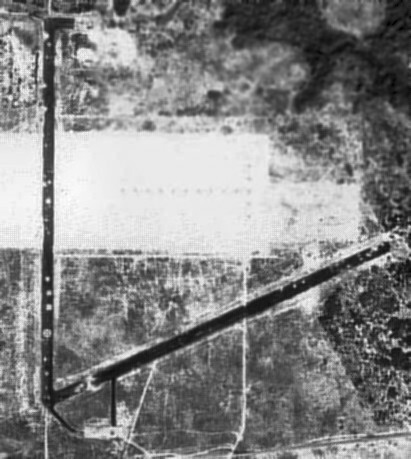 As seen in the 1995 USGS aerial photo, the remains of 3 runways (the longest is 4,400' long) still exist. The runways are marked with closed "X" markings. Piccolo Field currently serves as a microwave station. It is also known as Eglin Test Site C4. A 3/28/13 aerial view (courtesy of Dallam Oliver-Lee) of Piccolo Field. A 10/7/42 Army Air Forces aerial photo (courtesy of AFHRA, via Brian Rehwinkel) looking northwest at Auxiliary Field #4, with Auxiliary Field # 5 in the distance. No airfield was yet depicted at this location on the 1937 USGS topo map (courtesy of Dallam Oliver-Lee). 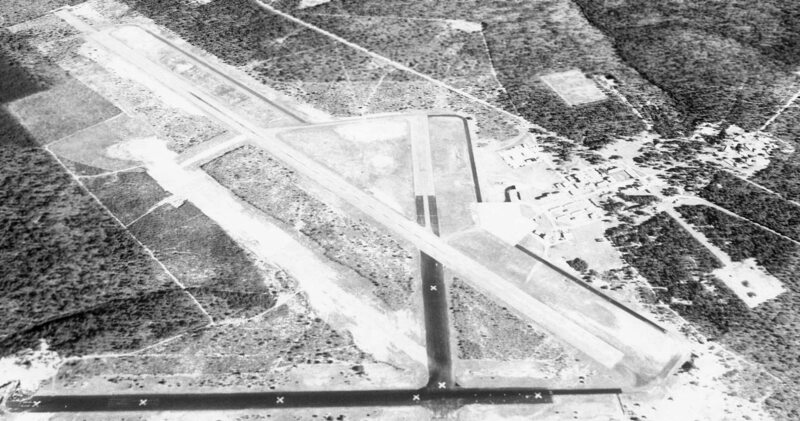 Peel Field was established as one of numerous satellite airfields which supported Eglin AAF. 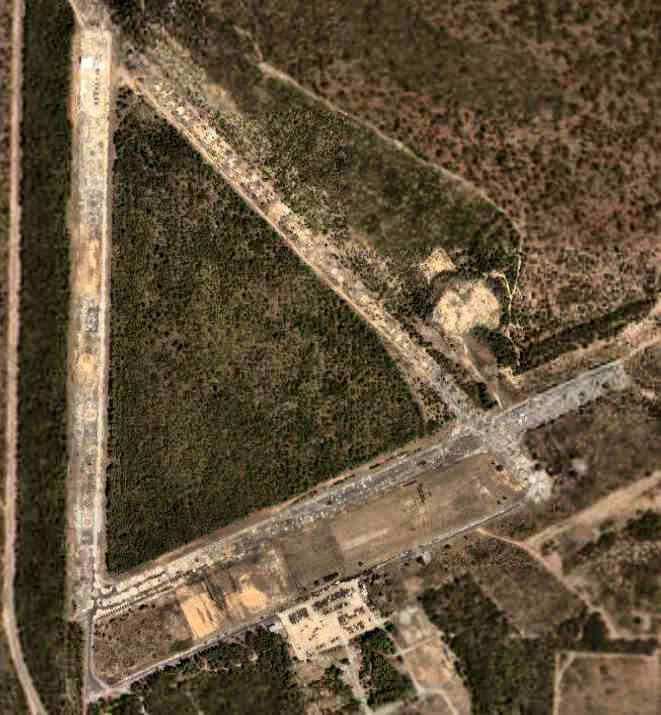 was a 10/7/42 Army Air Forces aerial photo (courtesy of AFHRA, via Brian Rehwinkel) of Auxiliary Field #4 in its original 2-runway configuration. Brian Rehwinkel reported, “A 3rd runway was authorized for Auxiliary Field #4 (and the other 6 gunnery fields) in August 1942. As with each of the gunnery fields, Field #4 had 2 nearby gunnery ranges. showing the new 3rd runway, and a large number of aircraft on its ramp. 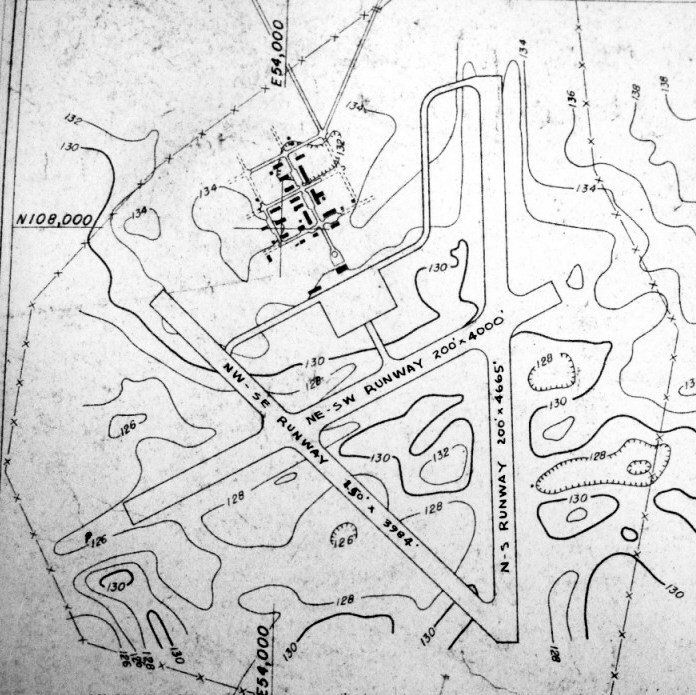 A 1943 Eglin Proving Ground Map (US Army Air Forces, courtesy of AFHRA via Brian Rehwinkel) of Auxiliary Field # 4 in its original 2-runway configuration. Other Eglin auxiliary airfields & the gunnery ranges were also shown. A circa 1943-44 US Army Air Forces photo (courtesy of AFHRA, via Brian Rehwinkel) of personnel at Auxiliary Field #4. Brian Rehwinkel observed, “The photo was apparently taken from the tower of the operations building & the runways are in the background of the picture. A 1/16/44 US Army Air Forces aerial view (courtesy of the National Archives, via Brian Rehwinkel) of Auxiliary Field #4, showing 10 aircraft on its ramp. 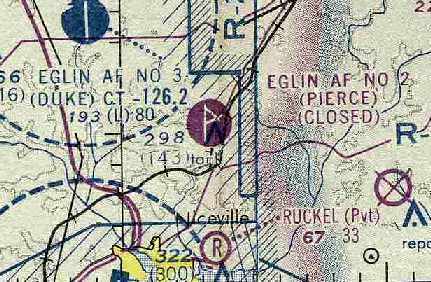 The earliest aeronautical chart depiction which has been located of Eglin Auxiliary #4 was on the January 1944 Mobile Sectional Chart. 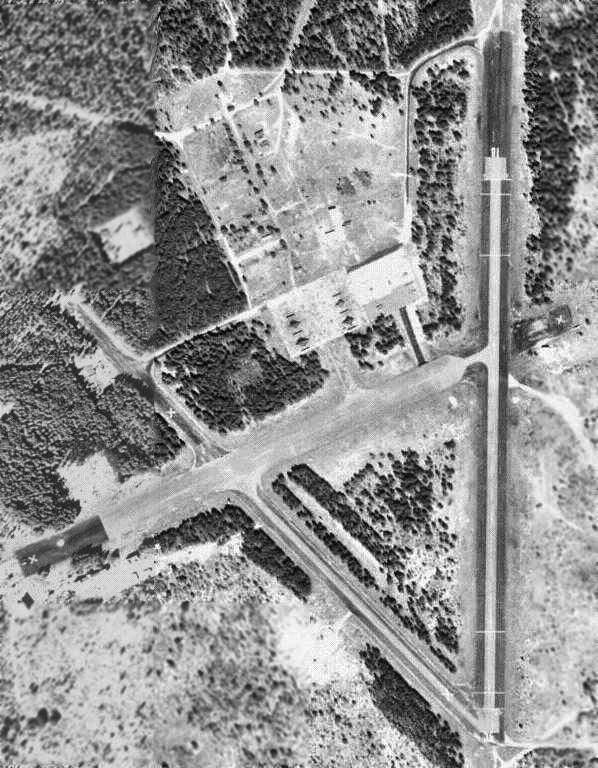 It depicted “#4” as an auxiliary airfield. Brian Rehwinkel reported, “In March 1944, all of the Auxiliary Fields, previously only referred to by their numerical designation, were named for fallen airman. Auxiliary Field #4 was named for 2nd Lt. Garland Peel, a gunnery instructor at Eglin Field who died in a plane crash on 1/2/42 near the main base. Field #4 had 3 asphalt runways (at the end of WWII) of 4,000’ x 200’, 4000’ x 200’, and 4,300 x 150’ on approximately 415 acres. This field had a concrete parking apron of 25,000 square feet. The small installation also had an operations building, with a tower, a small nose hangar, aircraft maintenance shops, and housing for about 200 airman & 100 officers. 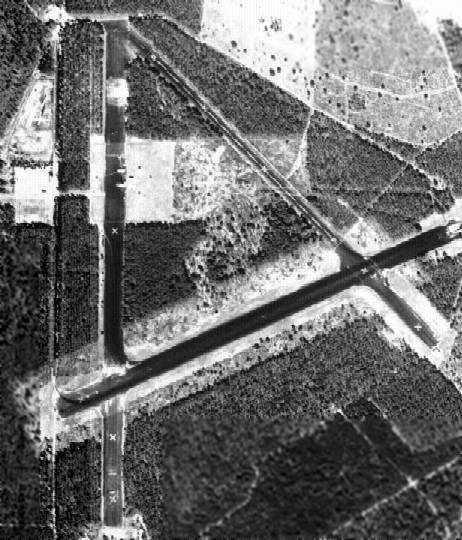 A 3/9/55 US Government aerial view of Eglin Aux #4 (courtesy of the FL DOT, via Brian Rehwinkel). Brian Rehwinkel observed, "Even though this picture shows the field almost 10 years after WW2, all the buildings & runways seem to be intact." 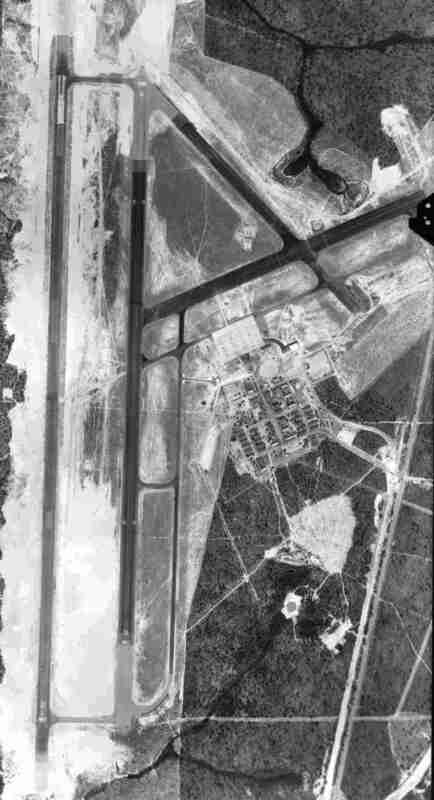 from the 3/9/55 US Government aerial view of Eglin Aux #4 (courtesy of the FL DOT, via Brian Rehwinkel). The 1956 Mobile Sectional Chart (courtesy of Dallam Oliver-Lee) depicted "AF #4" as having a 4,300' paved runway. but these rickety structures were condemned in the early 1960s & torn down. as having an 4,300' hard-surface runway. 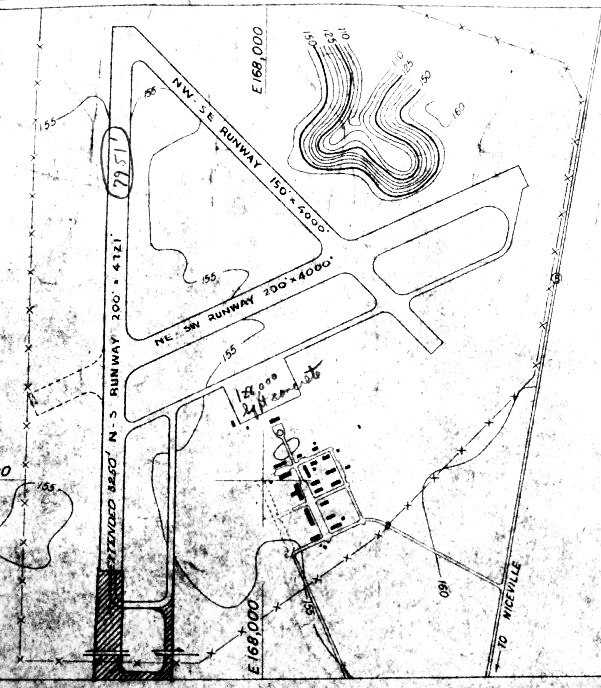 The 1970 USGS topo map depicted "Aux Field #4" as having 3 paved runways, a taxiway, and a ramp on the south side. Peel currently serves as the home for a variety of civil engineering & services mobility training programs. 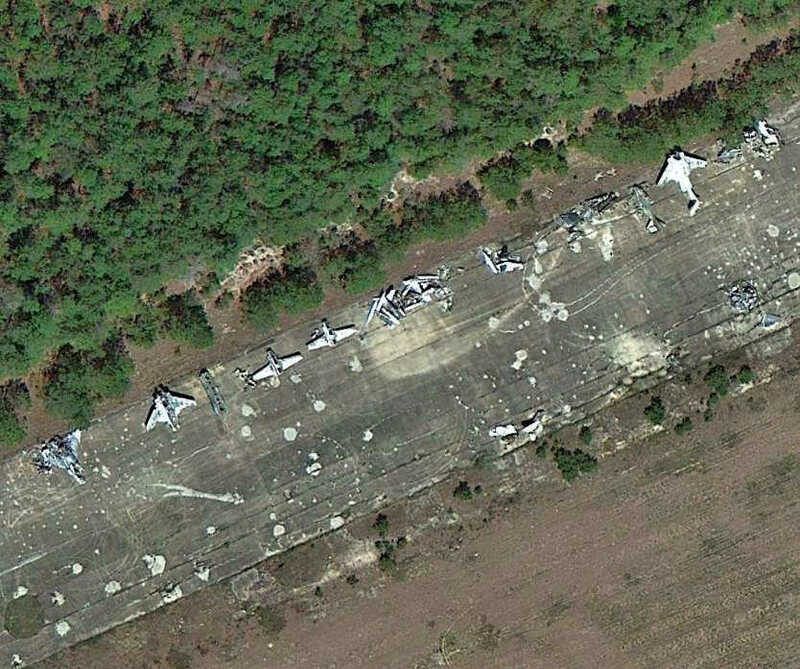 the remains of 3 runways (the longest is 4,400' long) & a large ramp area still exist. A circa 2000-2005 USGS aerial photo of Peel Field. 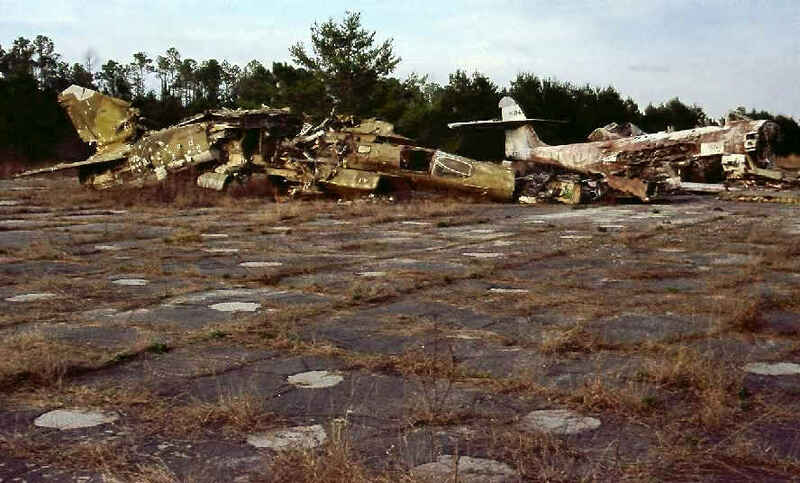 showing the remains of an F-89D Scorpion & an A-4 Skyhawk at the southeast runway intersection of Peel Field. 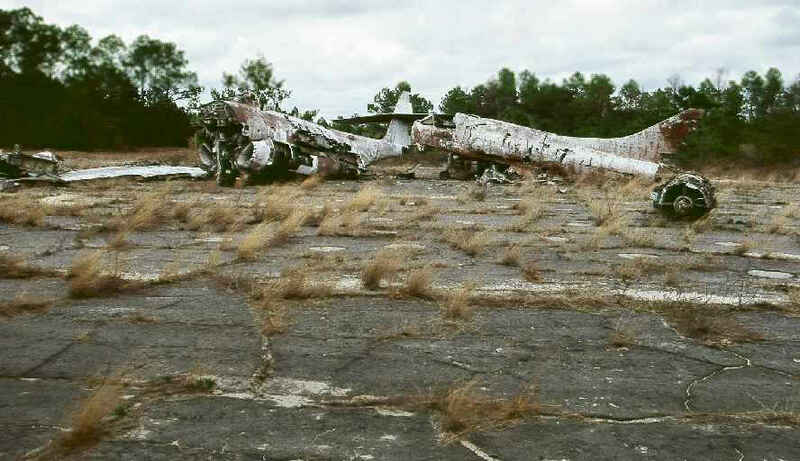 A 2006 photo by Mark Sublette of the remains of an F-89D Scorpion an A-4A Skyhawk on Peel Field. 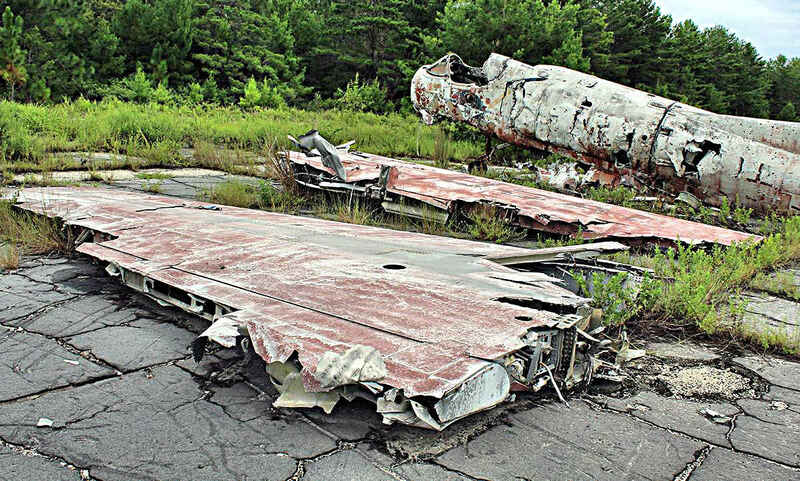 A 2/21/09 photo by Mark Sublette of the remains of a Luftwaffe MiG-23 Flogger, an F-89D Scorpion, and an A-4A Skyhawk on Peel Field. and all armor is now parked inside a new chain-link with barbed-wire top enclosure. The MiG appears to have taken a serious hit to the midsection – presumably some kind of damage-tolerance evaluation? A 3/28/13 aerial view (courtesy of Dallam Oliver-Lee) showing an array of historic aircraft wreckage on a Peel Field runway. A 3/28/13 aerial view (courtesy of Dallam Oliver-Lee) showing a single F-16 on the Peel Field ramp. A 9/3/16 photo by Matt Franklin of the sad remains of a Northrop F-89D Scorpion (65-NO53-2584) at Peel Field. Matt reported, “Most people go to the Panhandle to get trashed on the beach, but I went for the disused airports. A 9/3/16 closeup by Matt Franklin of the sad remains of a Northrop F-89D Scorpion (65-NO53-2584) at Peel Field. 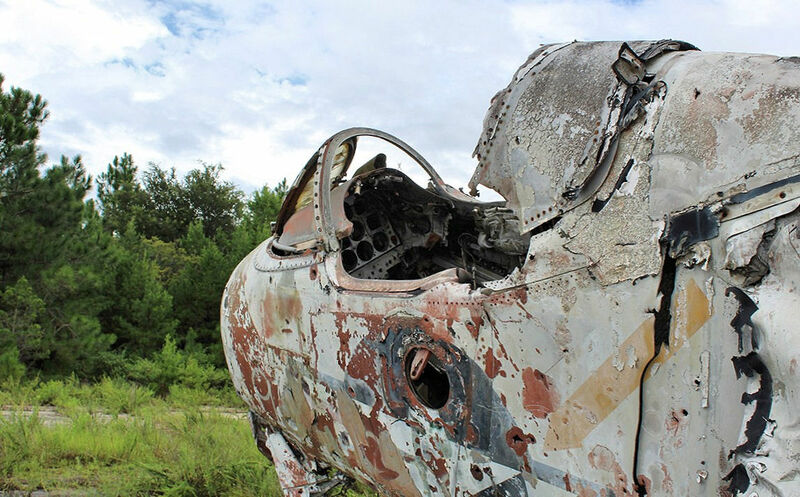 A 9/3/16 photo by Matt Franklin of the sad remains of an early-model Douglas A-4 Skyhawk at Peel Field. A 9/3/16 photo by Matt Franklin of the cockpit of an early-model Douglas A-4 Skyhawk at Peel Field, exposed to the elements. A 9/3/16 photo by Matt Franklin of a long row of M-48 or M-60 tanks “occupying the west runway” at Peel Field.